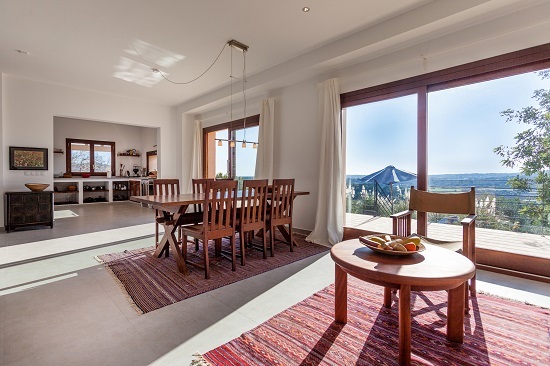 The atmosphere of this charming holiday home is uplifting and inspiring with open-aired spaces and breath-taking panoramic sea views. 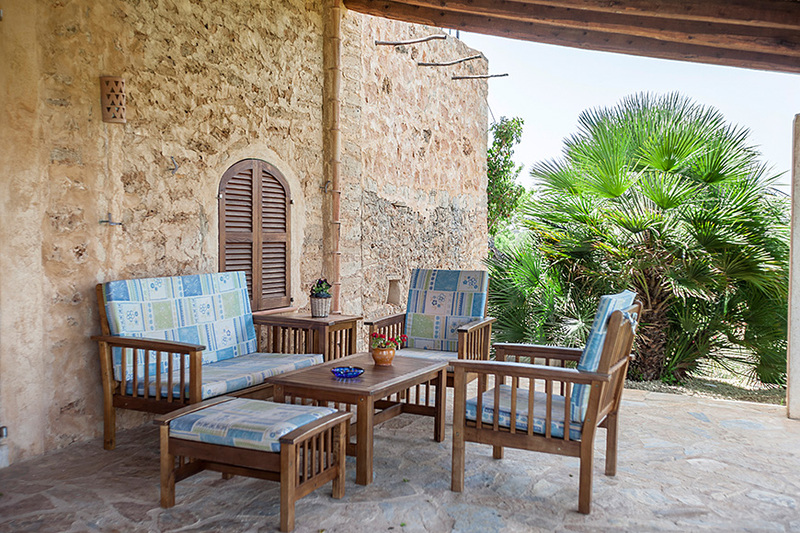 Sun and beach enthusiasts will love the four different terraces with teak furniture - and the direct access to two sandy beaches. 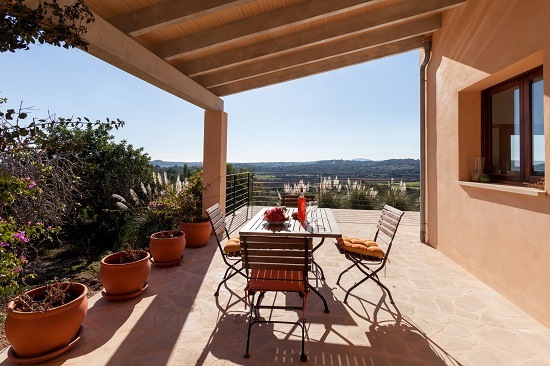 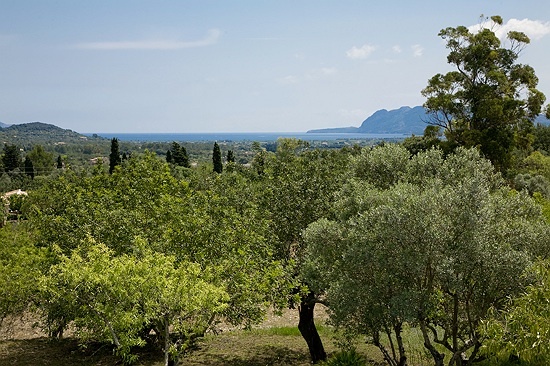 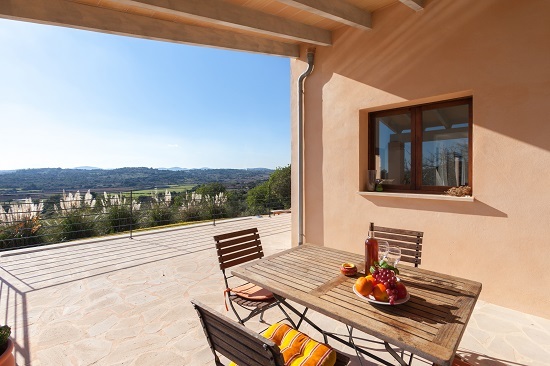 This well-appointed holiday retreat, surrounded by mature olive trees and large garden grounds, will enchant you with its marvellous views across most a scenic countryside and mountain panorama. 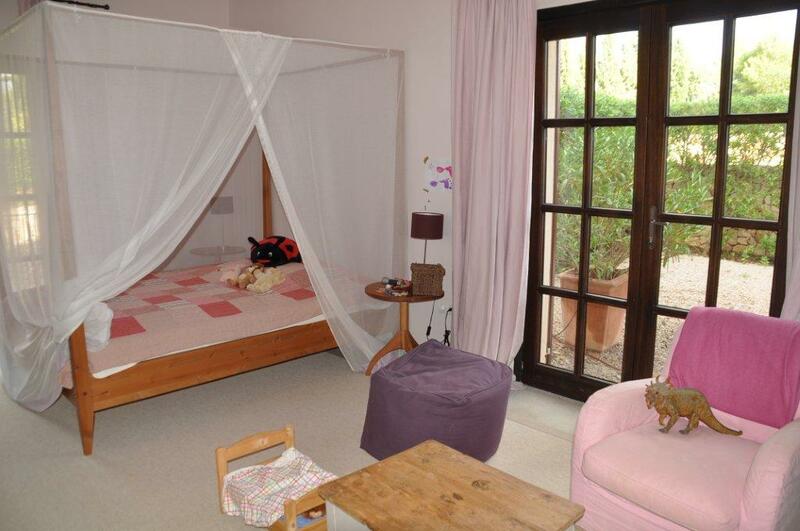 It is well suited for guests of all ages. 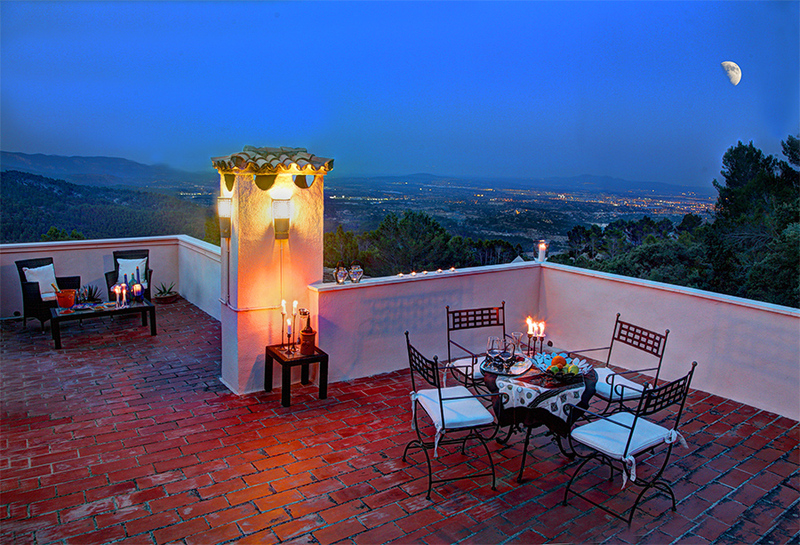 The spacious and elegant Finca boasts a heavenly ambience and fantastic panoramic views. 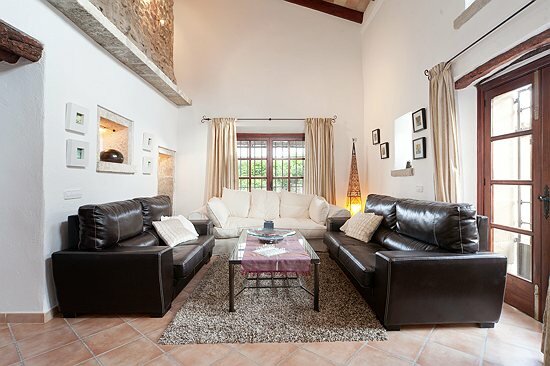 Larger groups can consider renting out the sister Finca, Xica Gran?, which is only a stone's throw away. 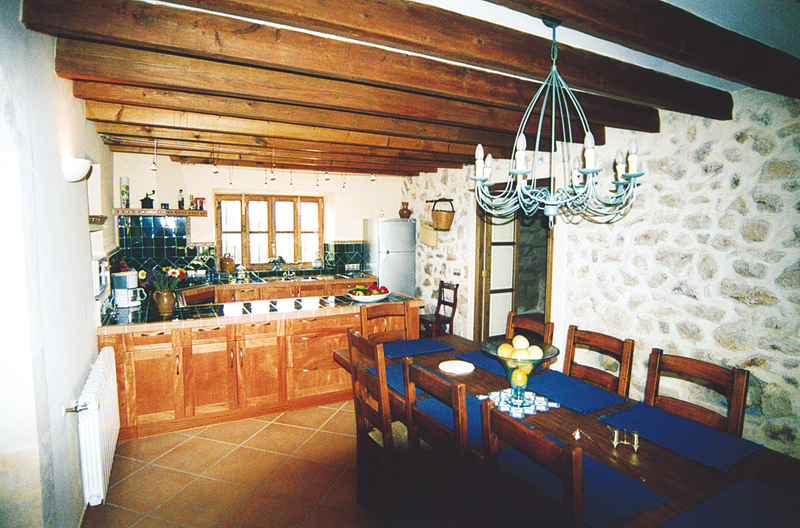 Central heating allows for all year occupation of this property. 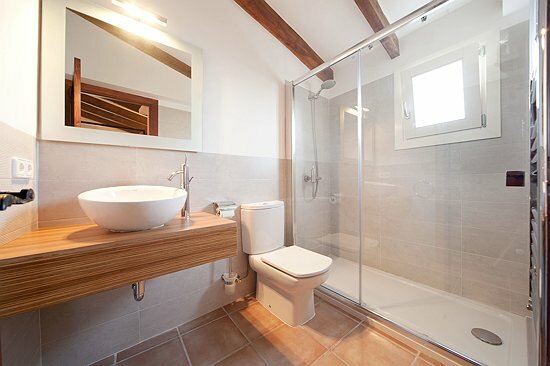 Internet available (W-LAN). 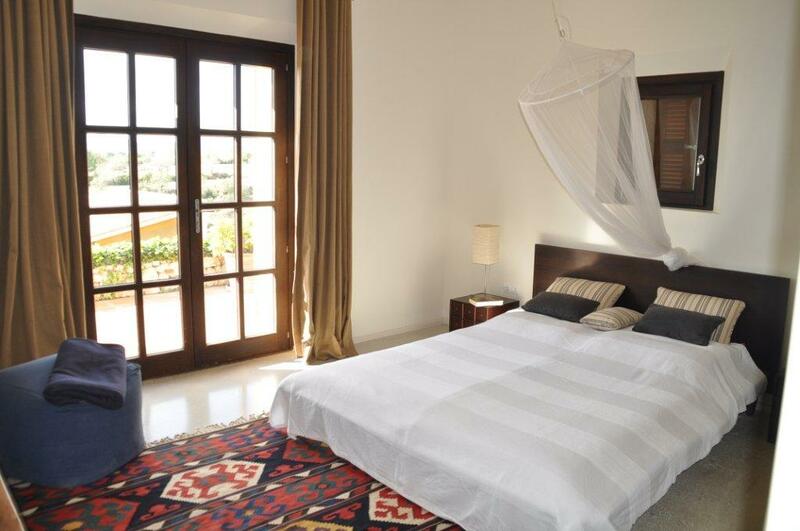 The spacious and elegant Finca boasts a heavenly ambience and fantastic panoramic views. 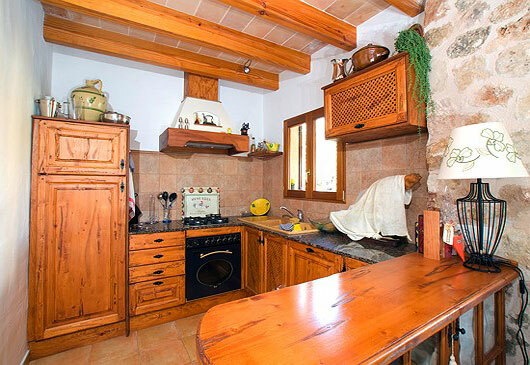 Larger groups can consider renting out the sister Finca "Xica Petit", which is only a stone’s throw away. 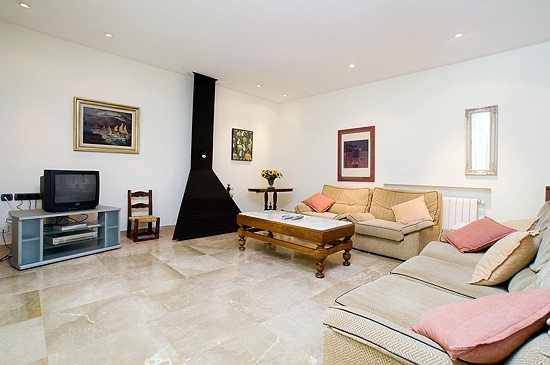 Central heating allows for all year occupation of this property. 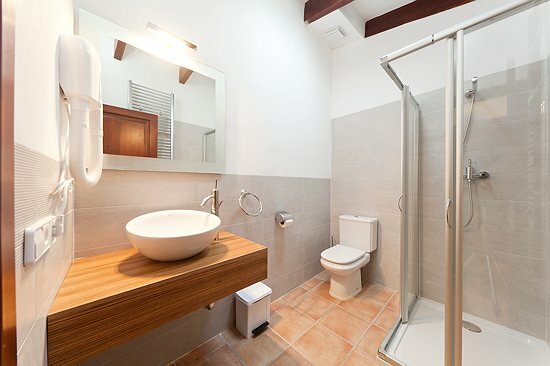 Internet available (W-LAN). 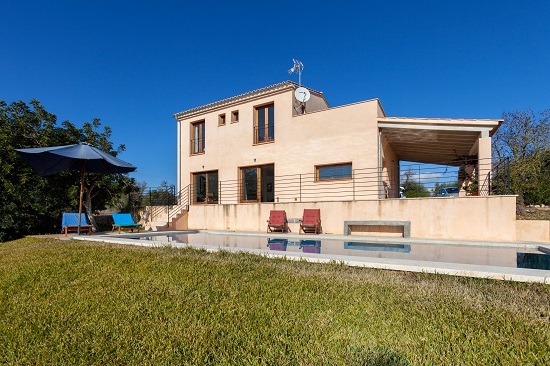 Embedded in a most beautiful landscape the newly built, modern villa lies enthroned on a hill with spectacular panoramic views across the peaceful, serene valley to the blue bay of Port de Pollença. 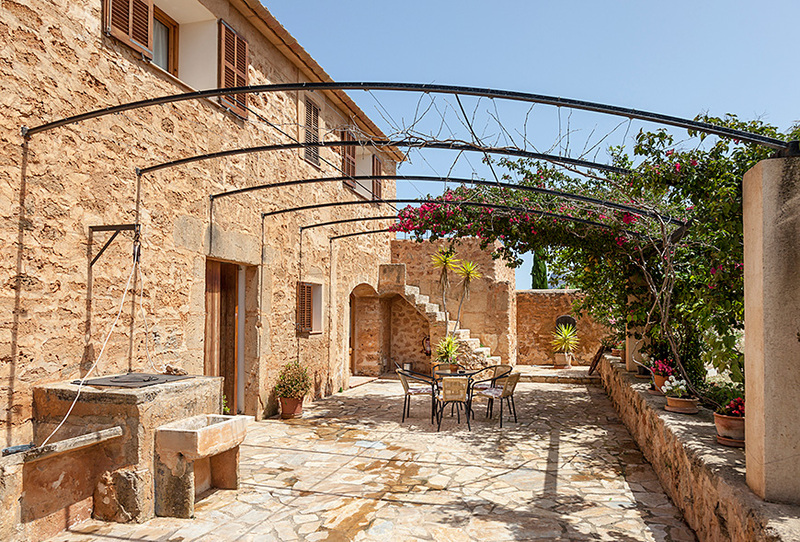 It is only minutes to the sandy beach of Port de Pollença, as well as to the town of Pollença with plenty more dining and shopping options. 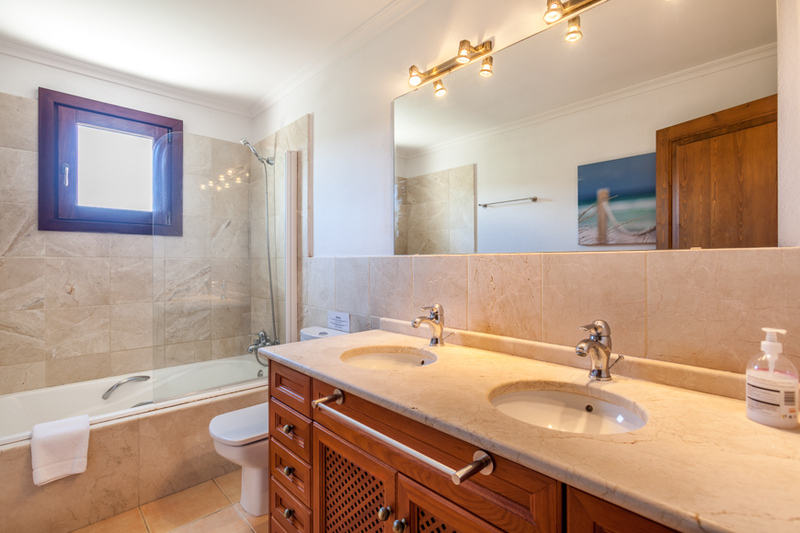 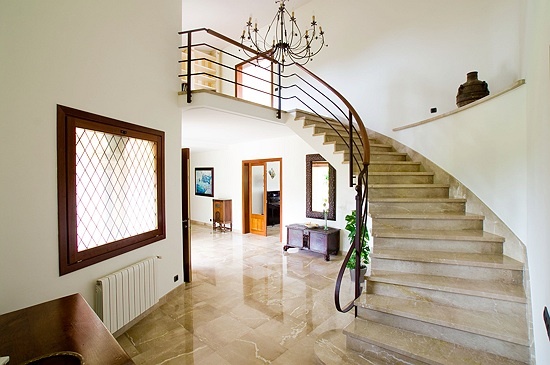 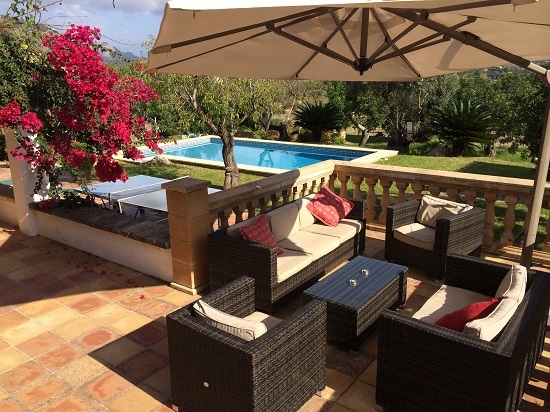 Meticulously restored with original Majorcan features, this holiday home with a most charming pool garden is a real gem and offers quality lifestyle for observant guests. 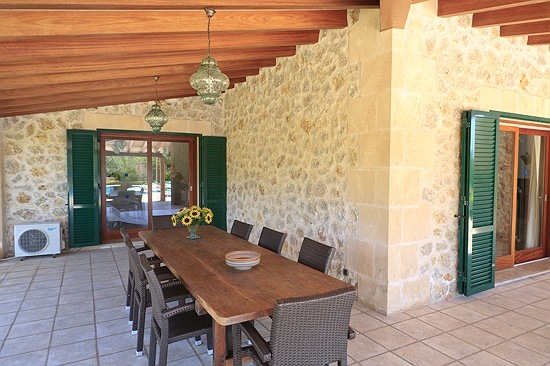 The finca owns about ca. 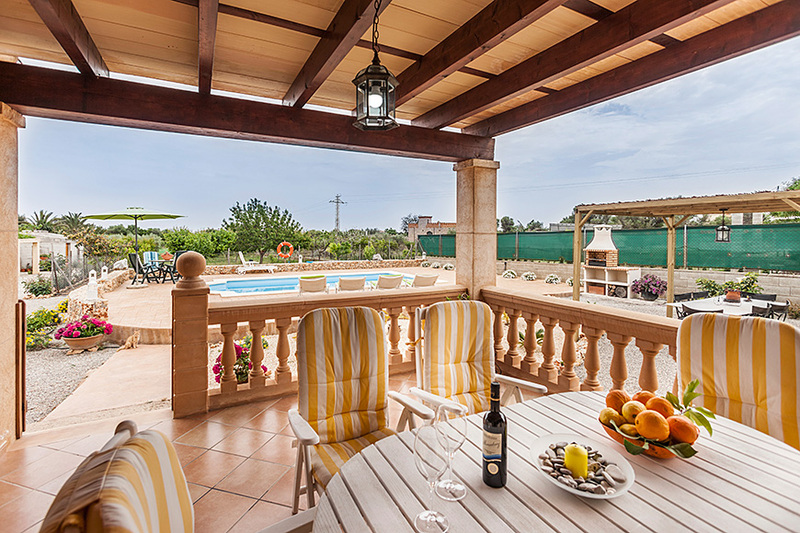 200 m² terraces. 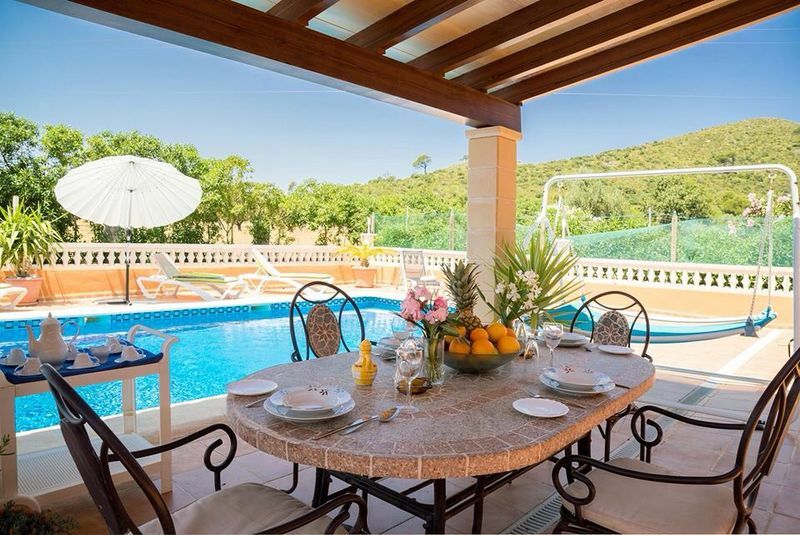 The dignified and comfortable interior, the privacy and peace of the landscaped pool garden and endless views across the lush and natural environment affords pleasure and relaxation. 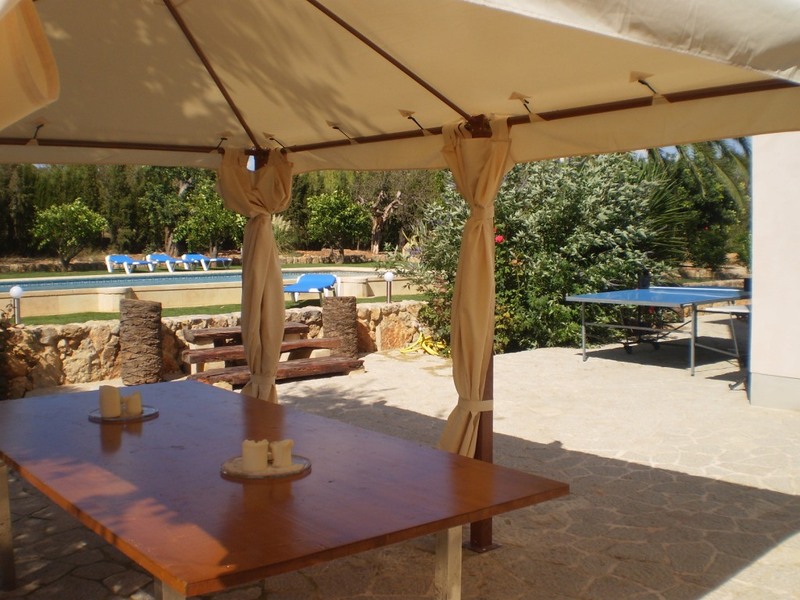 Internet (W-LAN) and table tennis available. 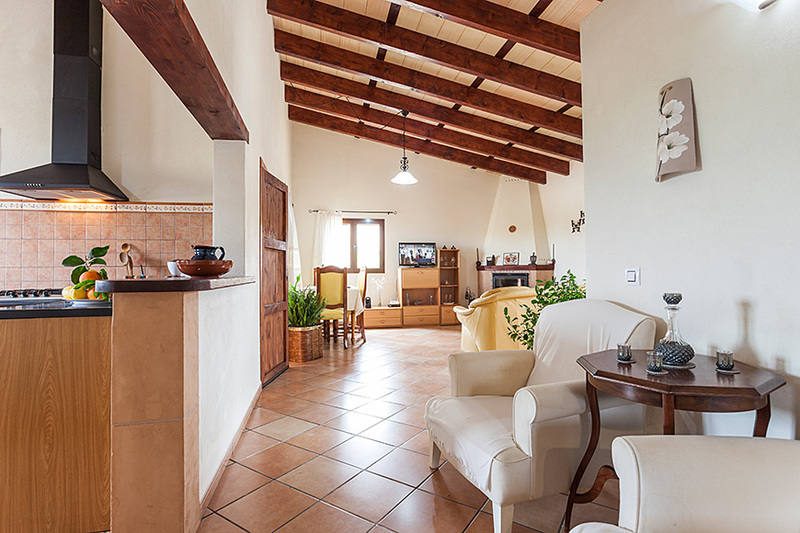 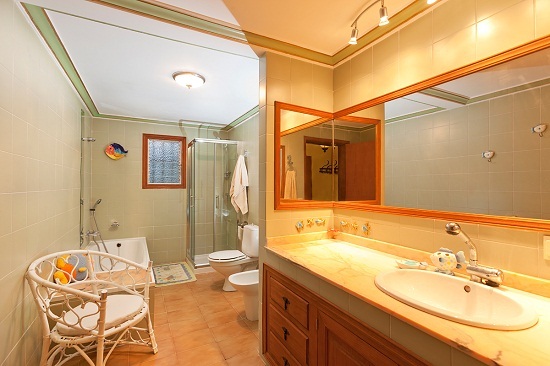 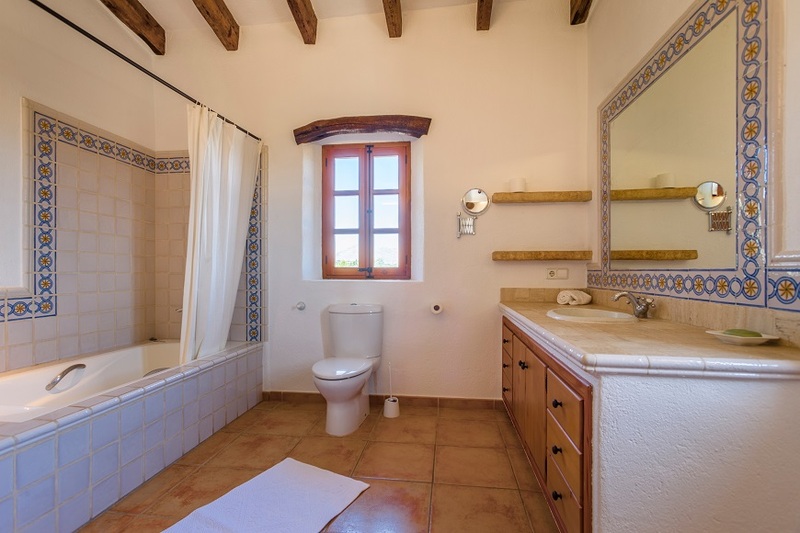 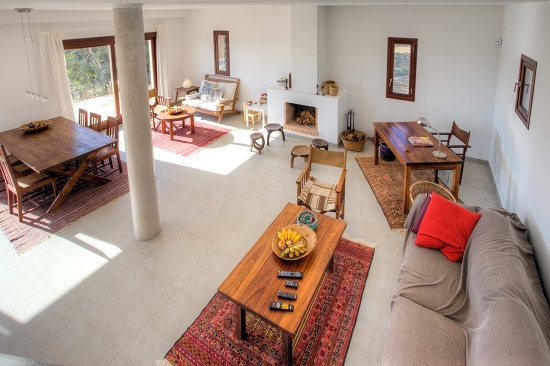 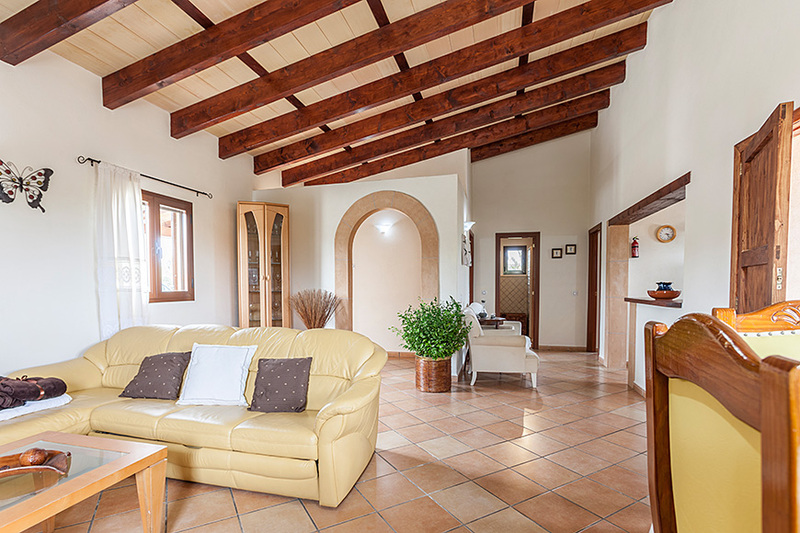 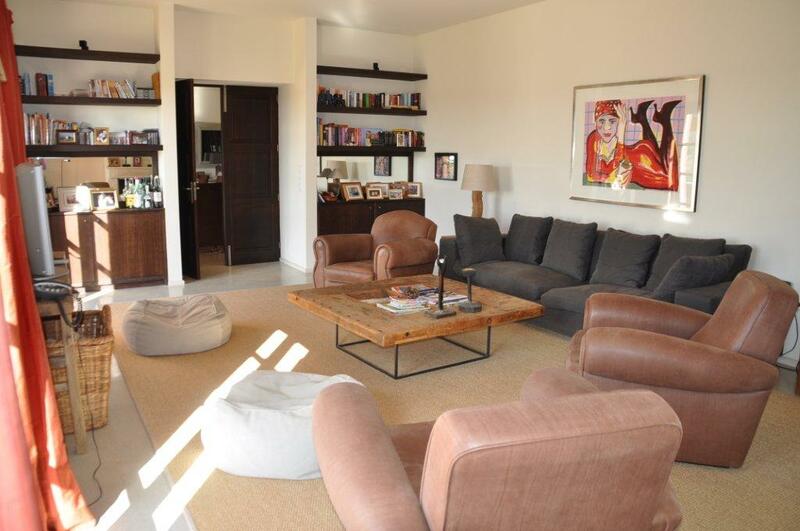 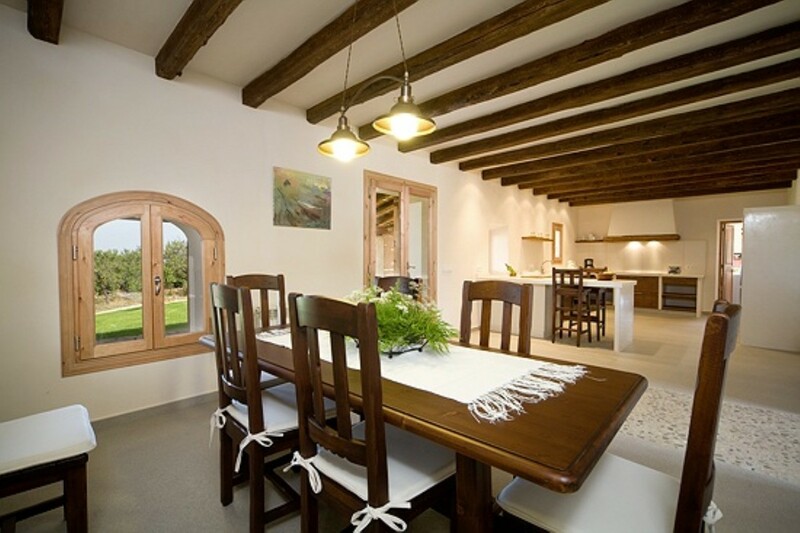 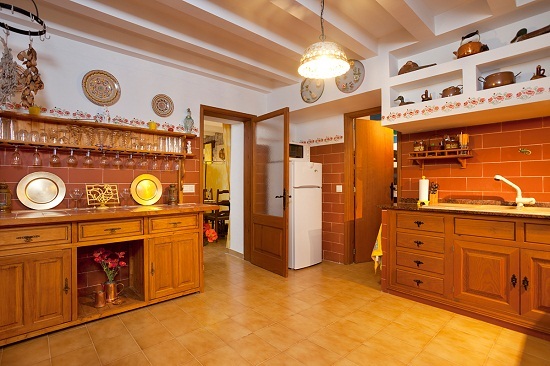 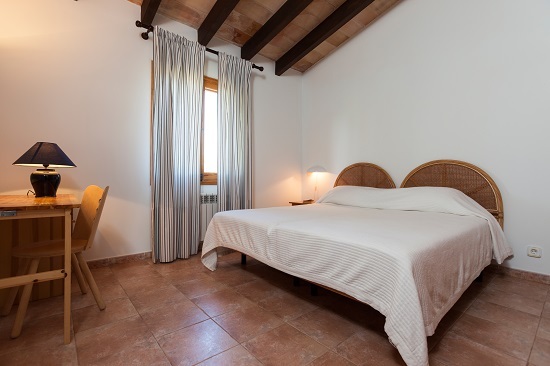 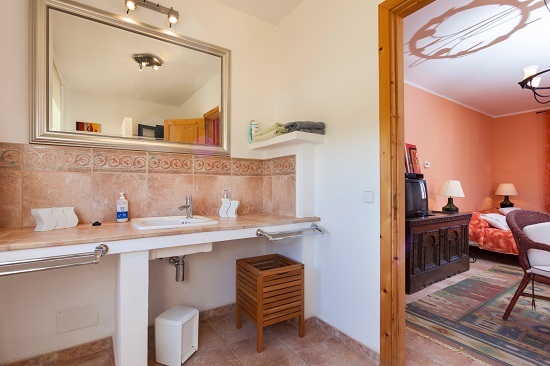 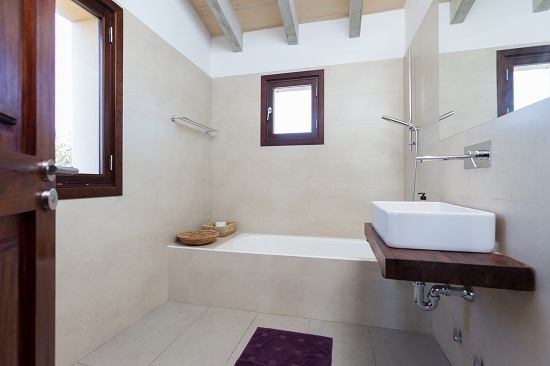 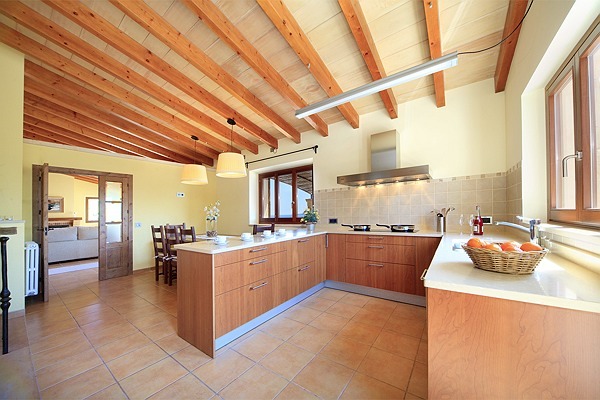 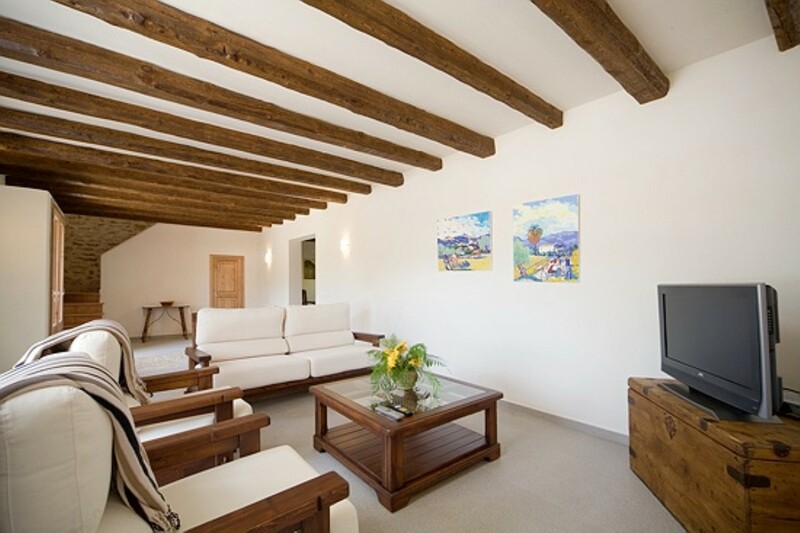 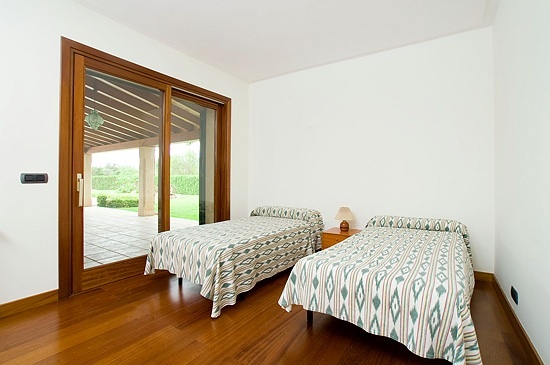 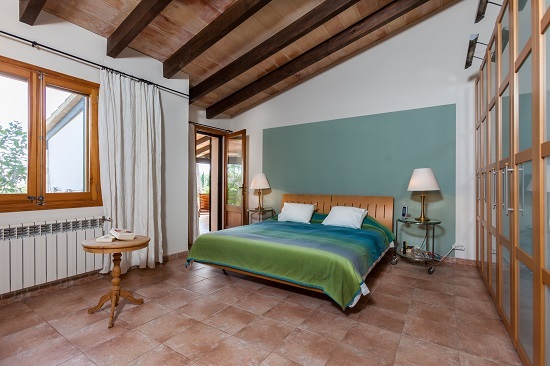 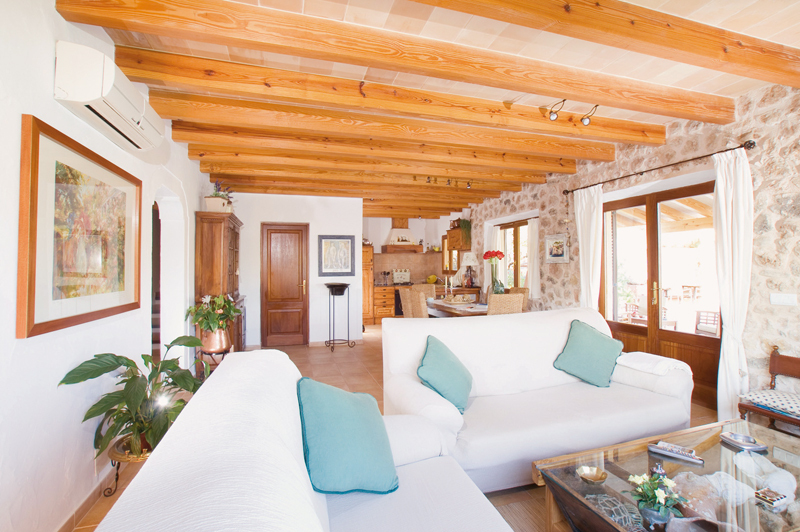 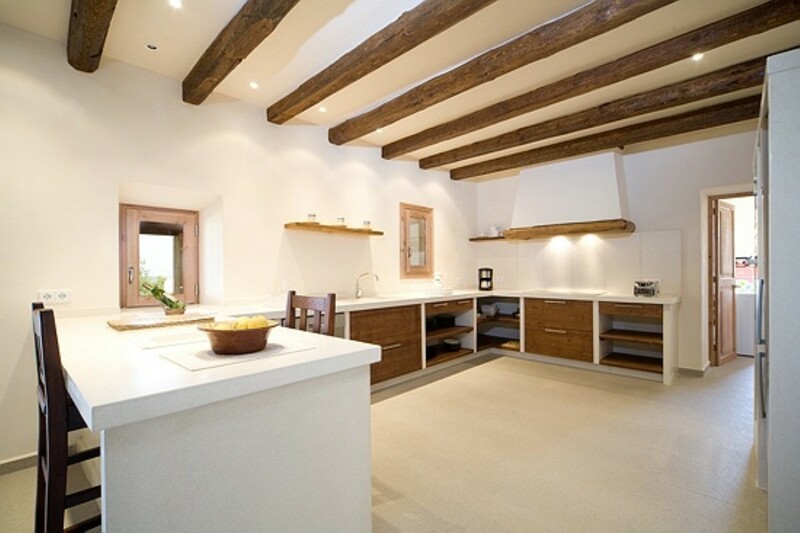 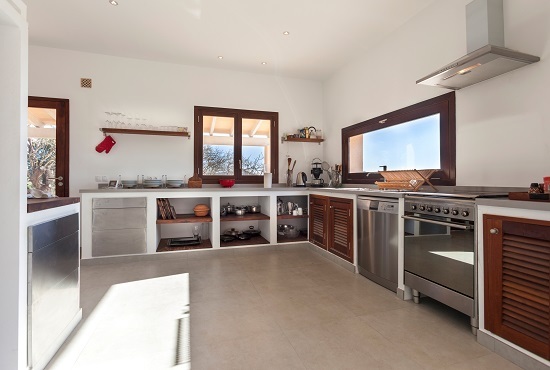 The authentic Finca harmoniously combines the traditional building style with a modern, bright interior design. 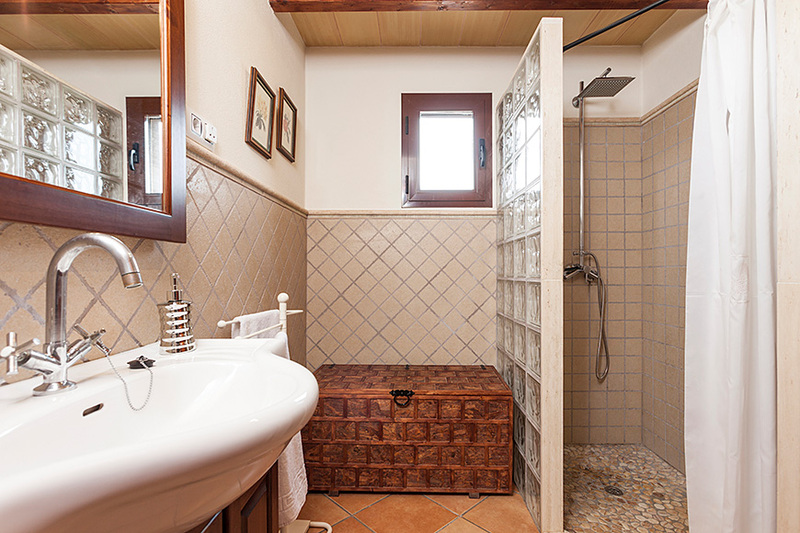 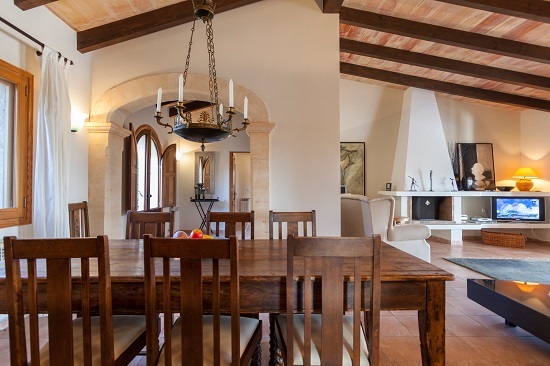 Chosen with love to detail the contemporary living concept presents itself in harmony with the charm of old stone walls and wooden beams and gives the property an overall feeling of style and comfort. 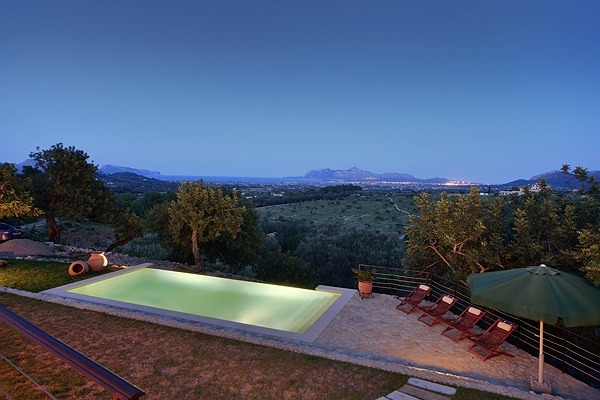 In addition, the illumination of the saltwater pool creates a very special atmosphere at night. 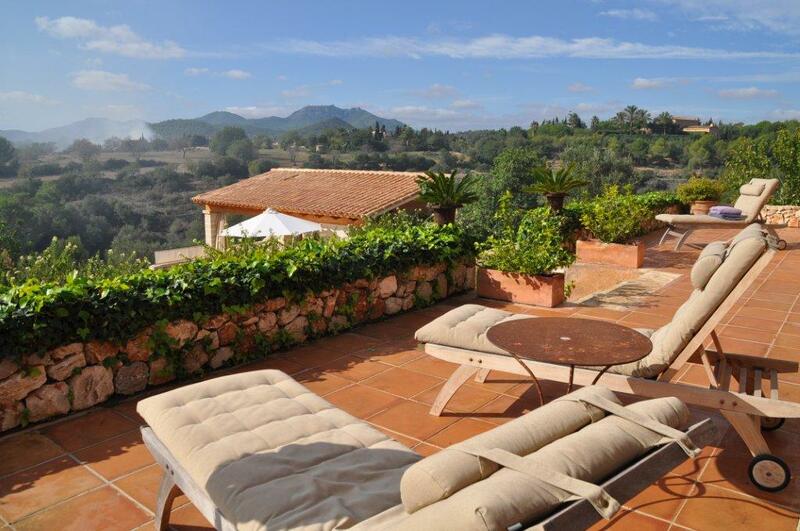 This well-kept finca is peacefully located on the slopes of Tramuntana mountains very close the sea. 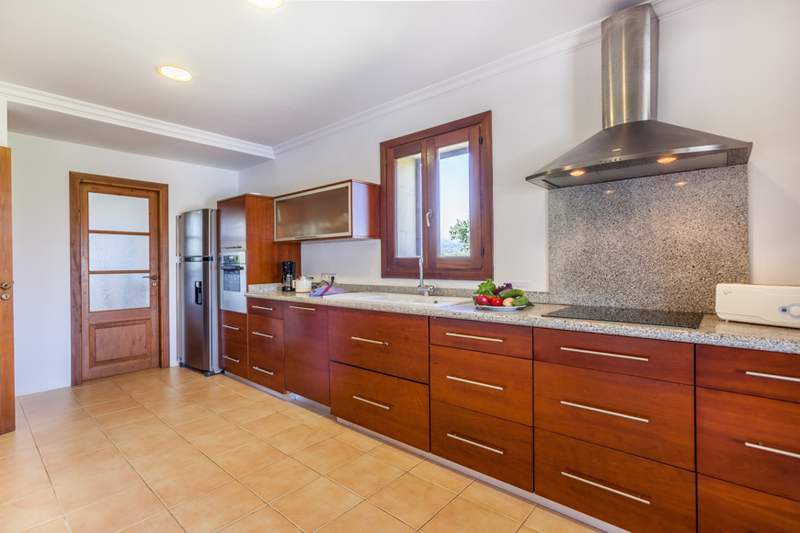 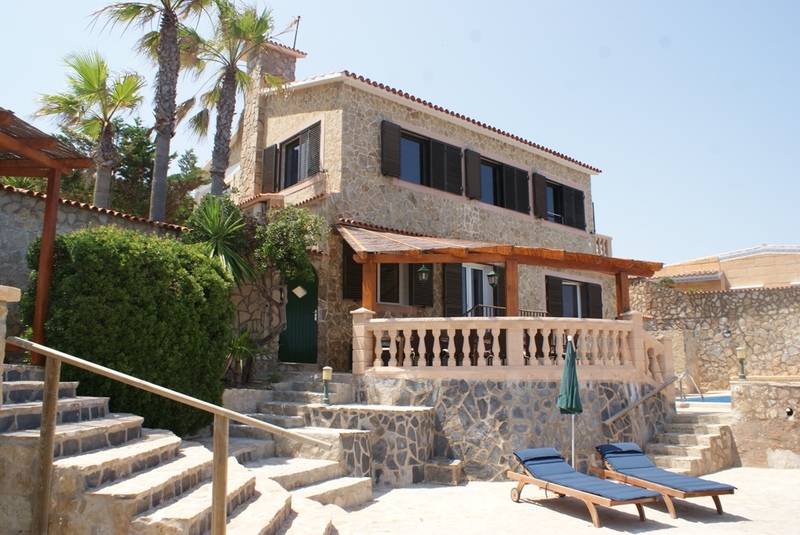 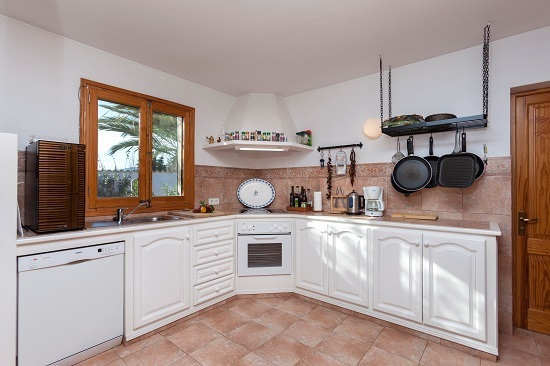 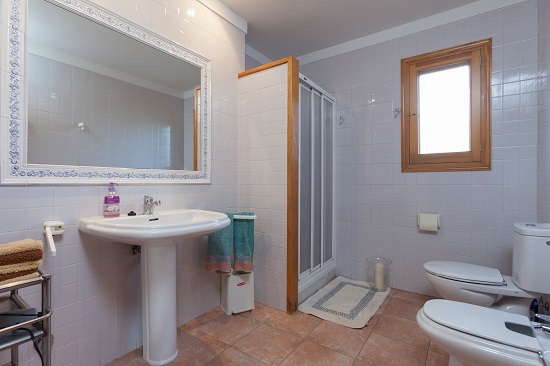 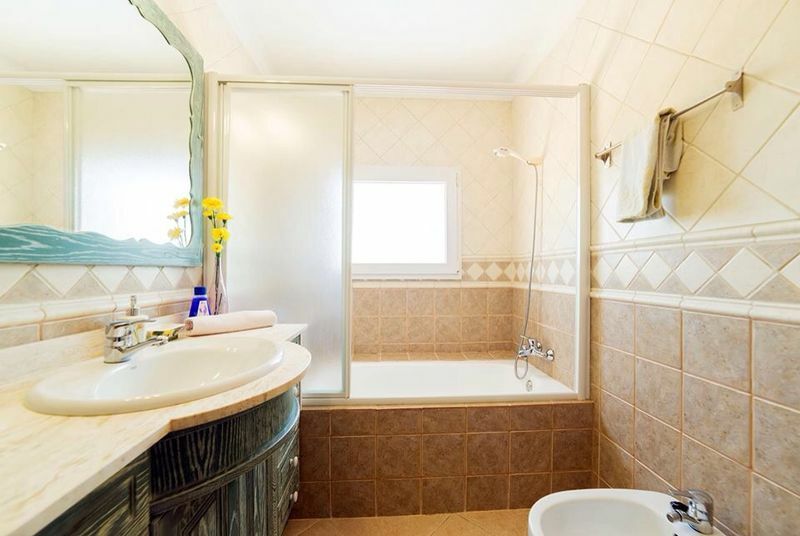 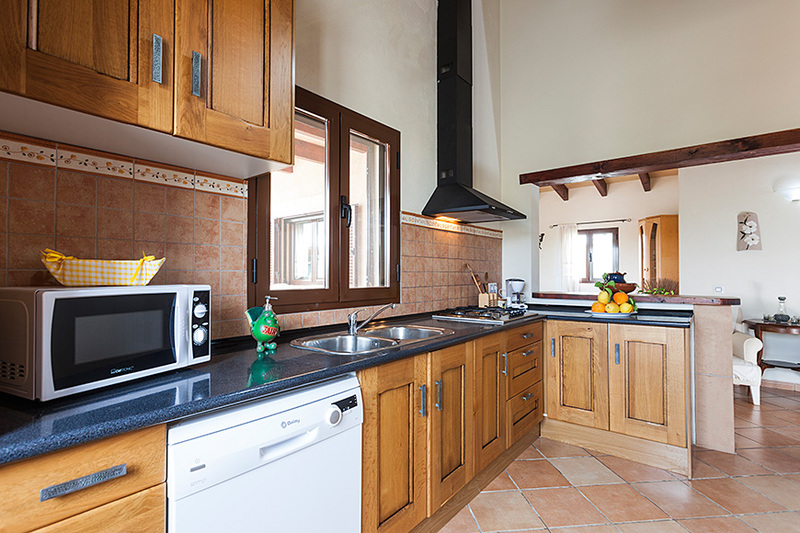 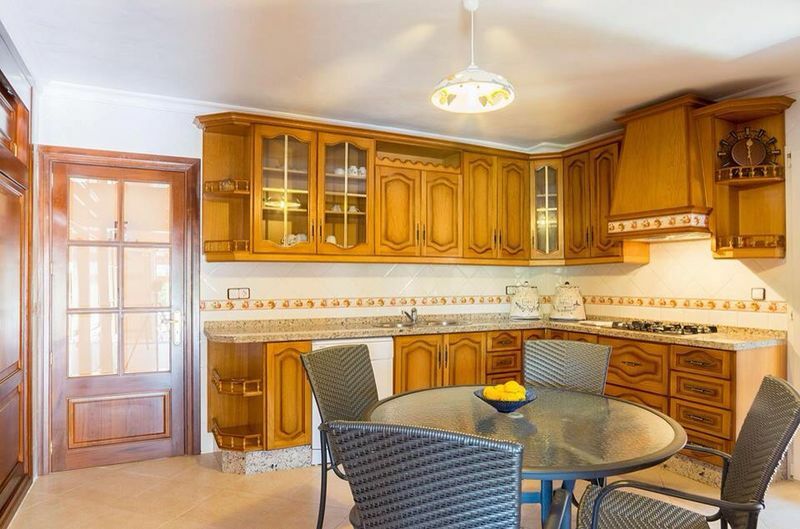 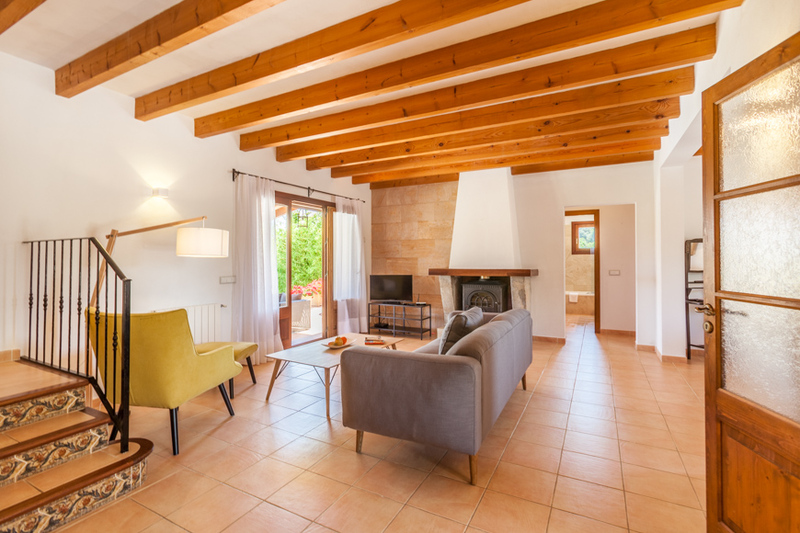 Due to its central location, this holiday home is ideal for beach lovers, sports enthusiasts and bon vivants, as there are all kind of different restaurants and shops in the near towns of Pollença and Port de Pollença. 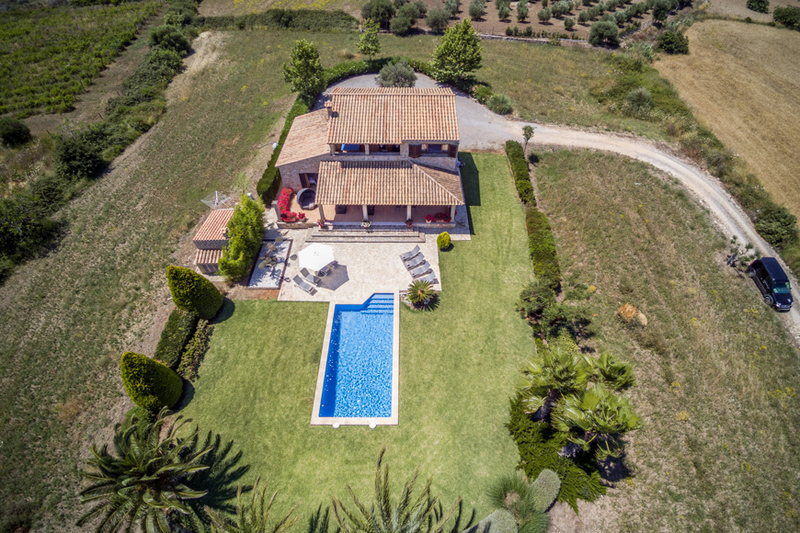 The impressive Finca with immaculate style and high comfort is located in a most privileged area for activities of all kind. 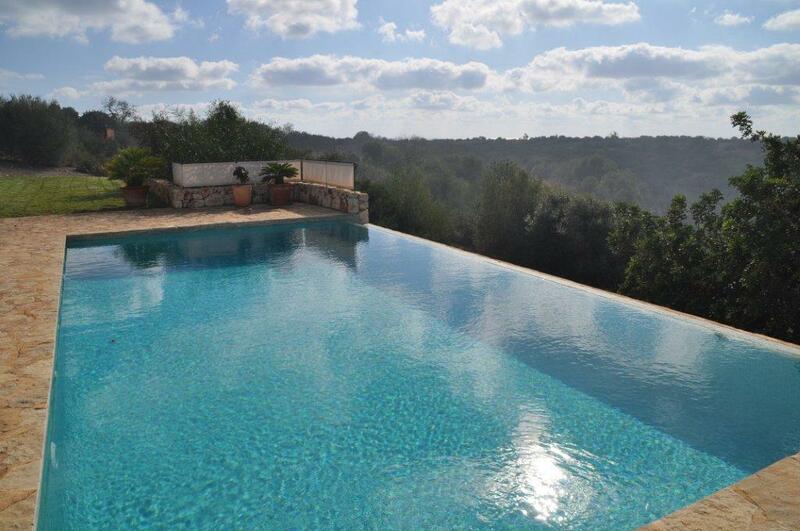 Above the pool an additional sun terrace reveals marvellous views across the countryside and the coast. 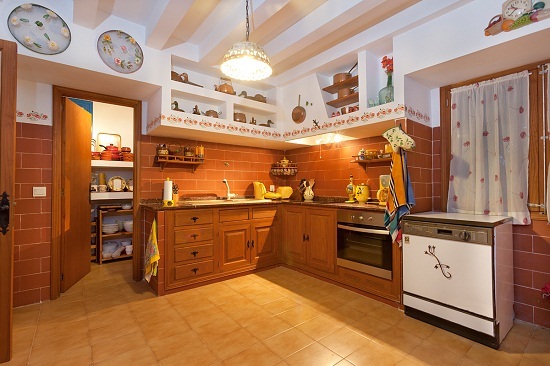 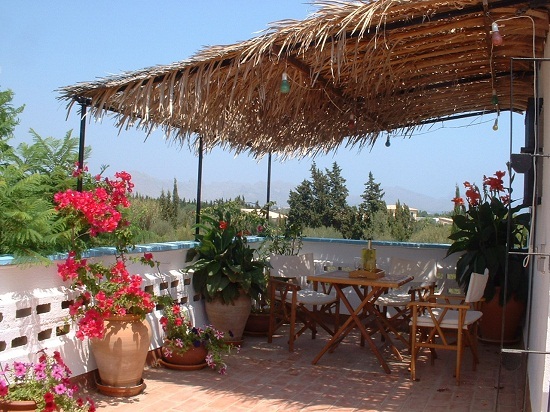 Air conditioning and central heating allow for an all year occupation of this holiday retreat. 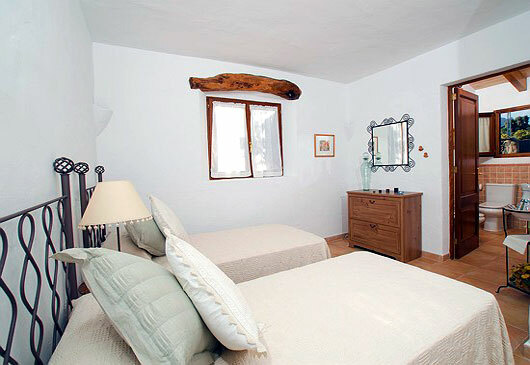 Internet available (W-LAN). 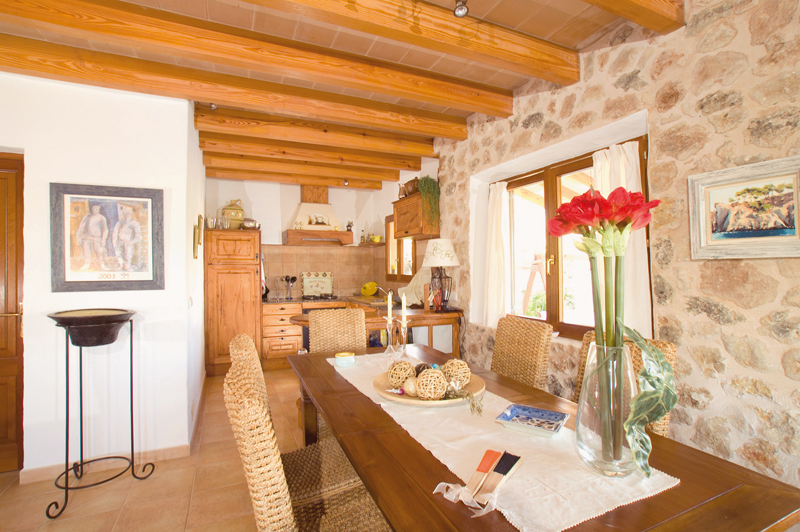 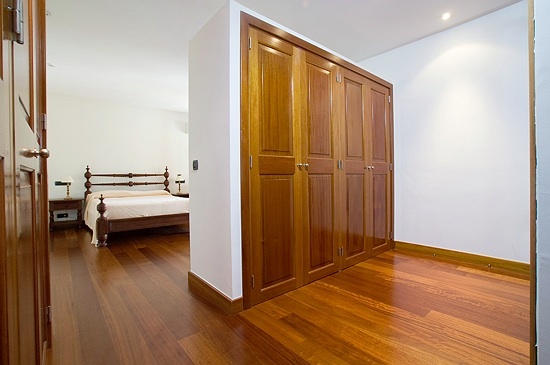 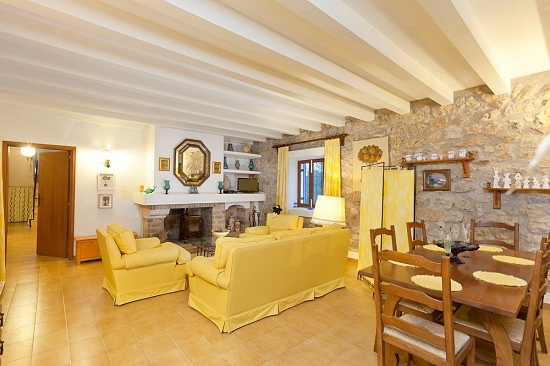 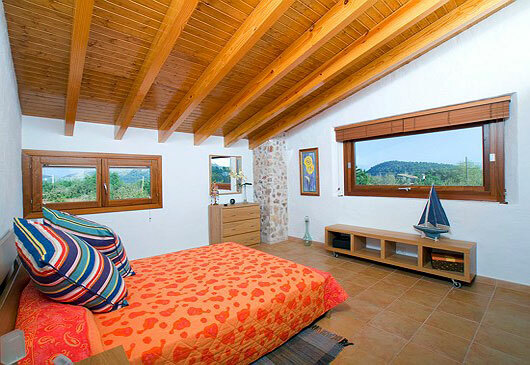 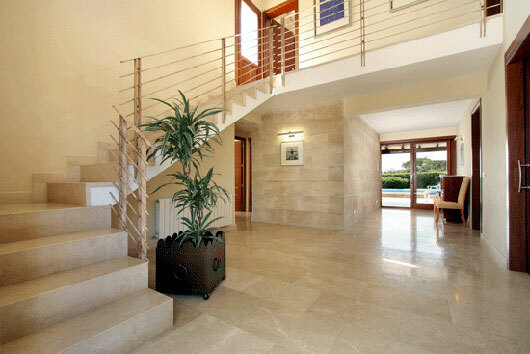 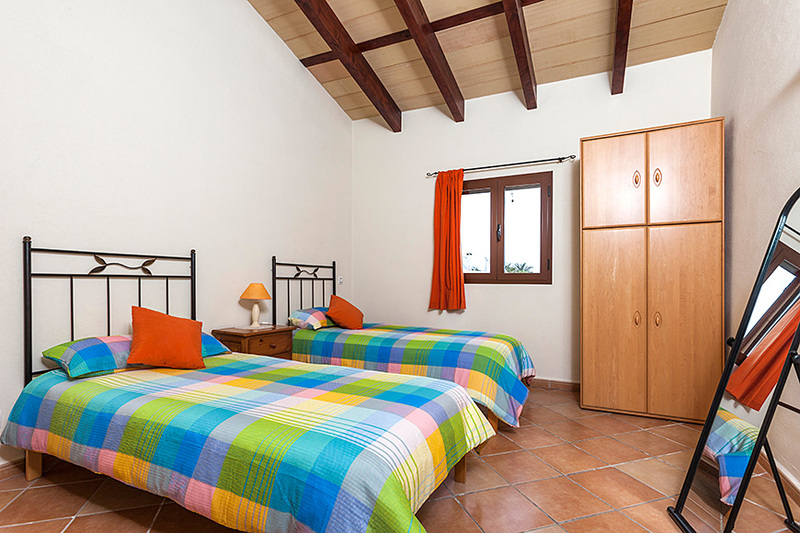 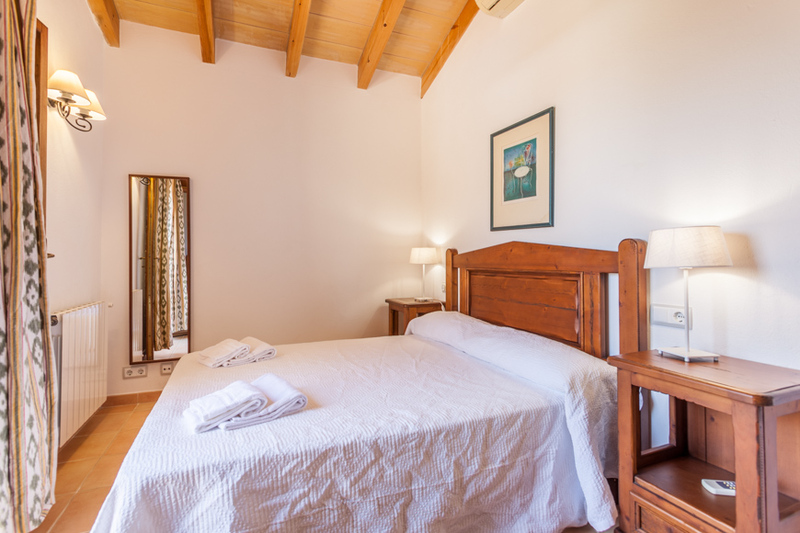 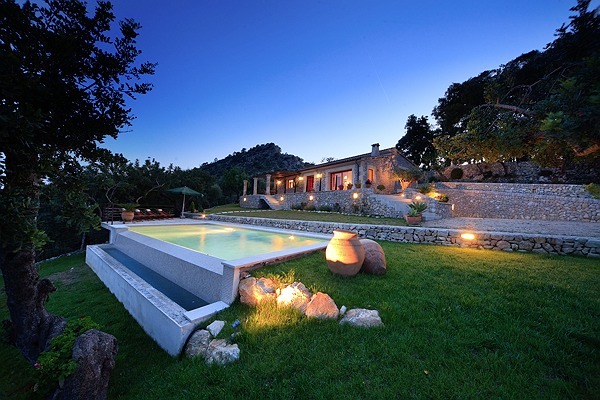 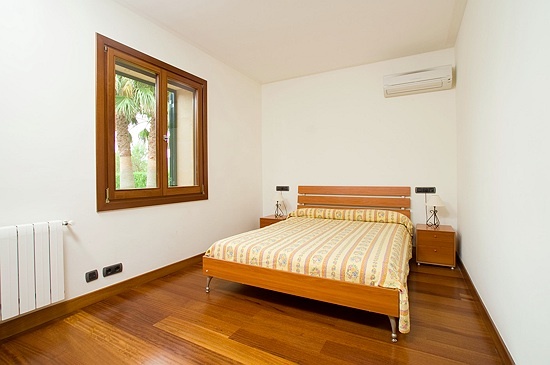 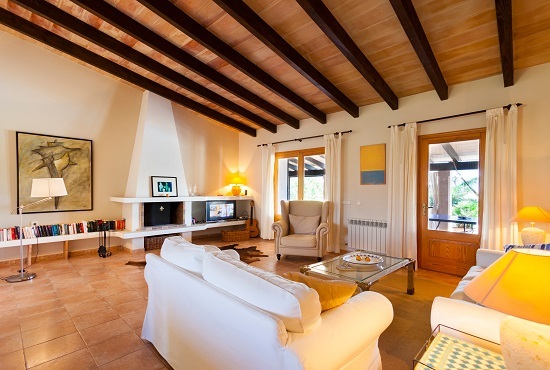 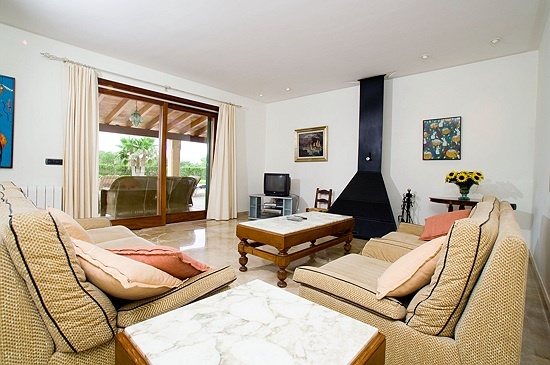 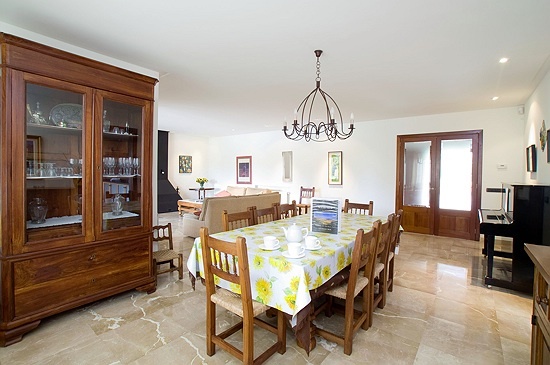 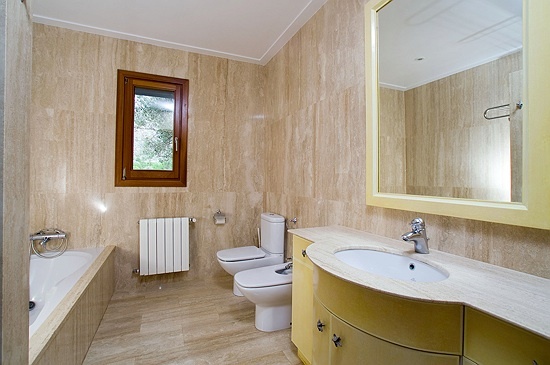 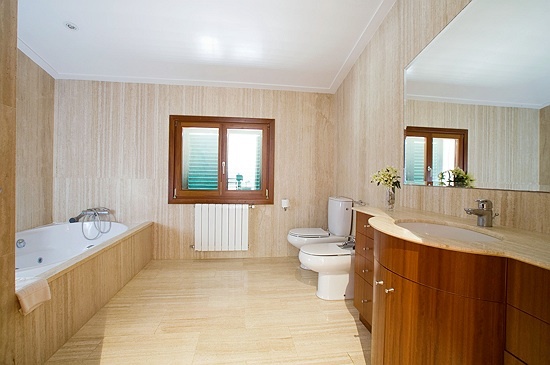 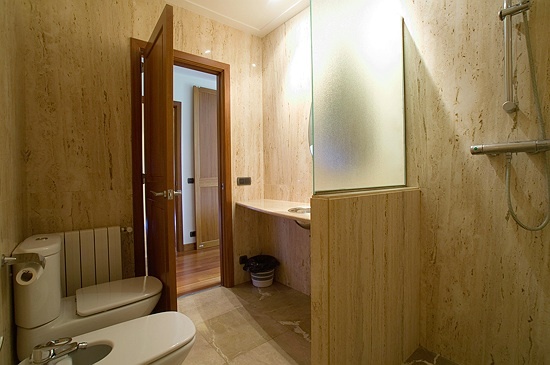 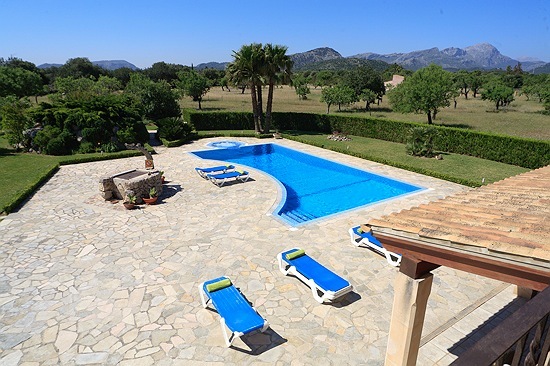 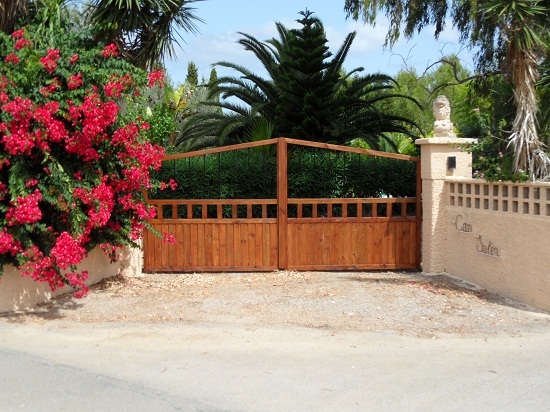 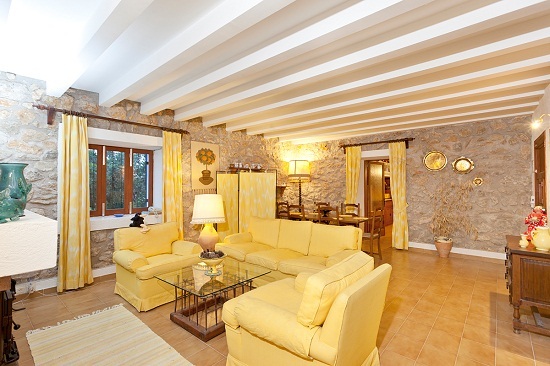 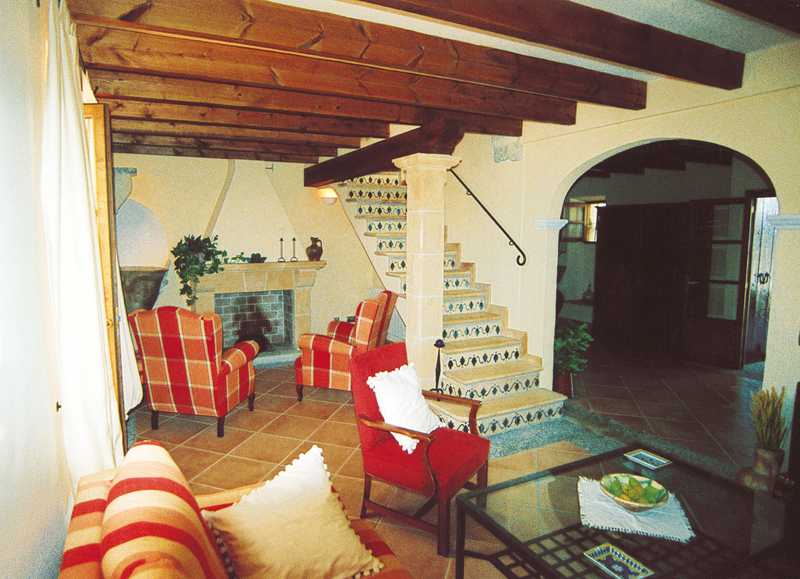 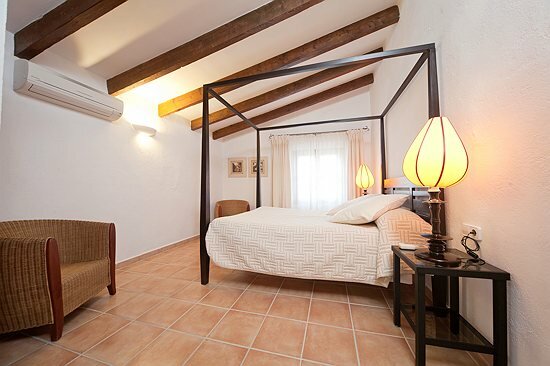 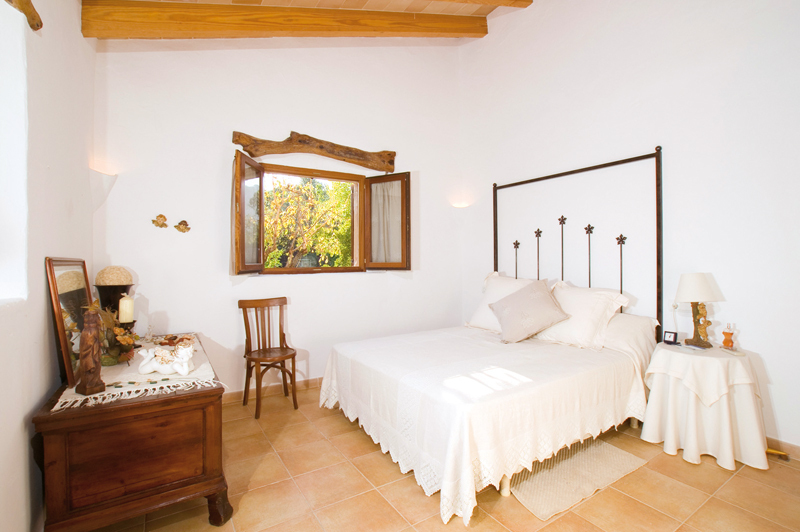 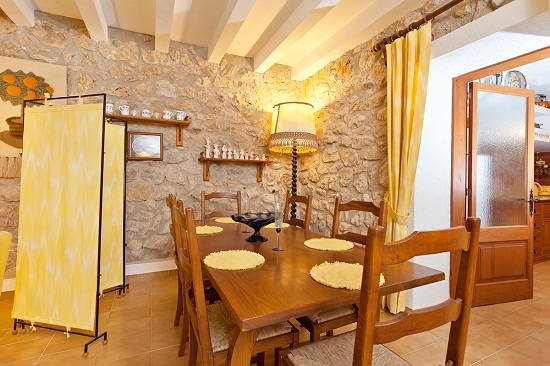 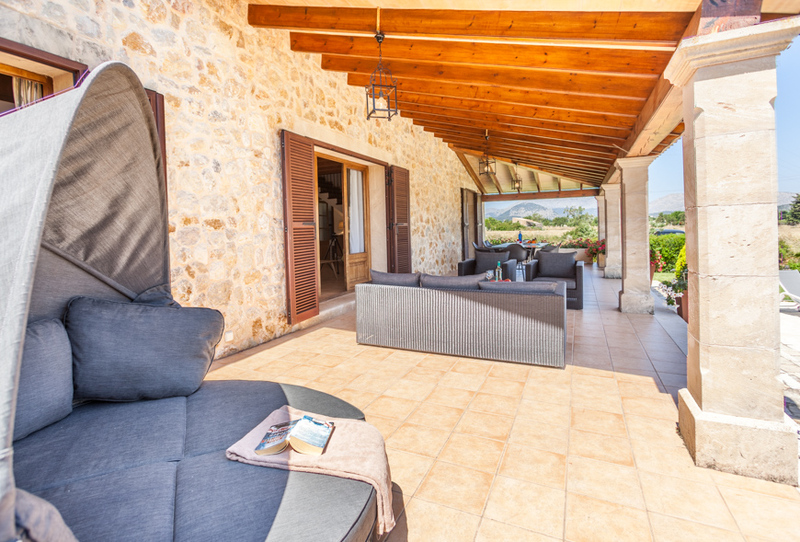 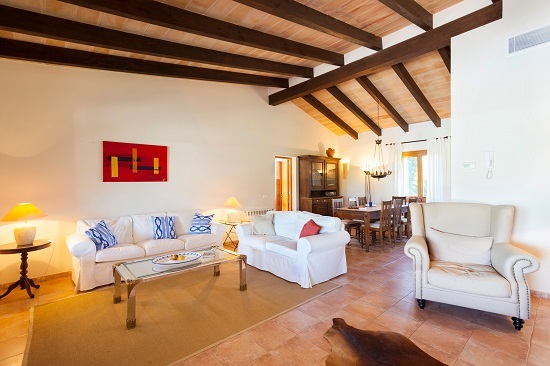 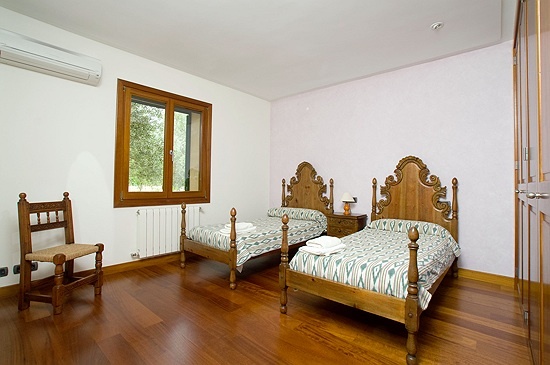 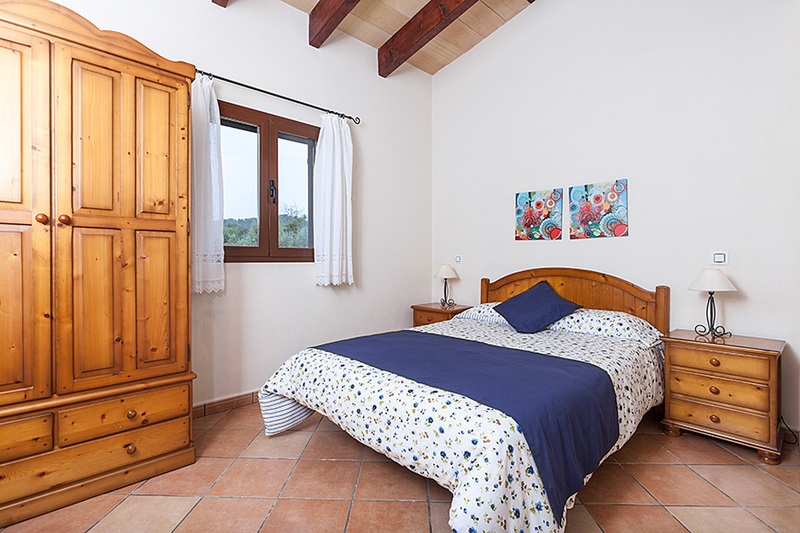 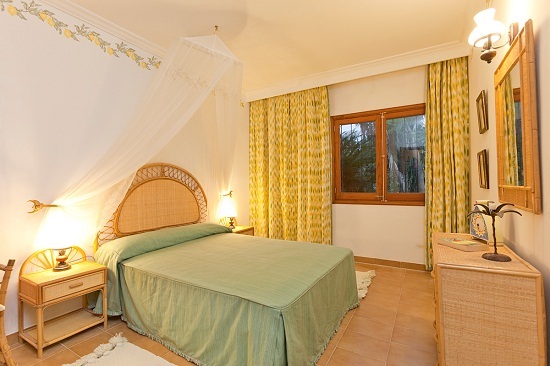 Can Vista has a wonderful setting, nestling in the serene countryside of Pollensa, not far away from the golf course. 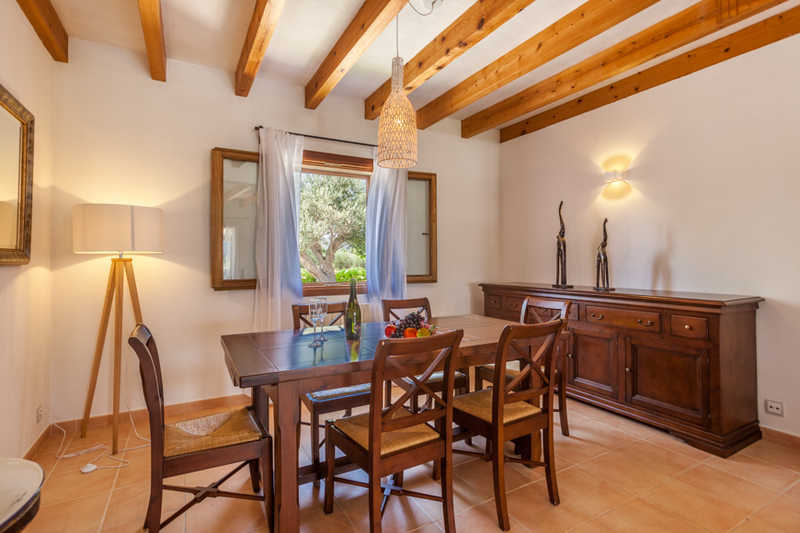 The entrance hall leads into the fully equipped kitchen and the bright living and dining room with large cream-coloured sofas and a dining table for 10 guests. 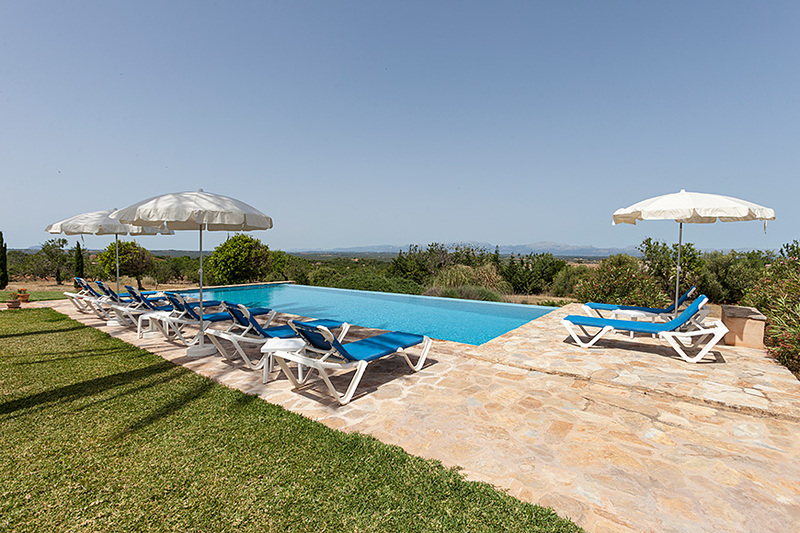 From here access the generous, sun-protected terrace and enjoy the views across the beautiful pool area and the garden. 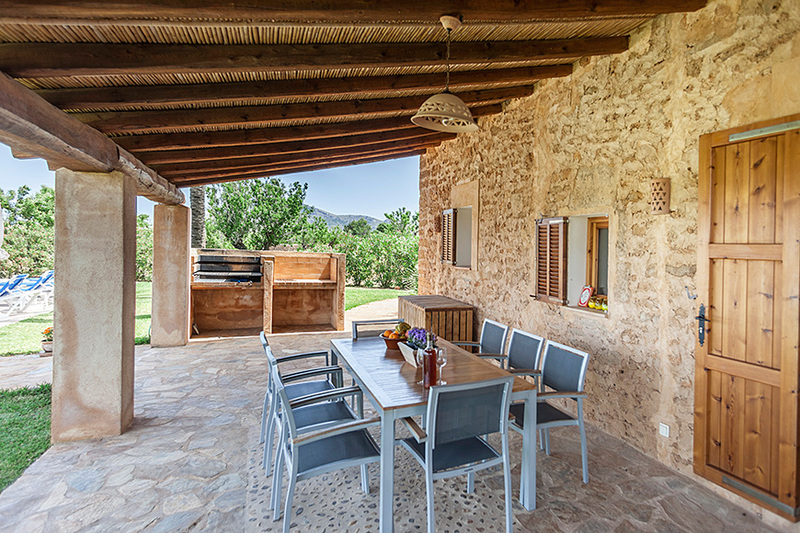 The in-built BBQ invites for al-fresco dinners with the whole family. 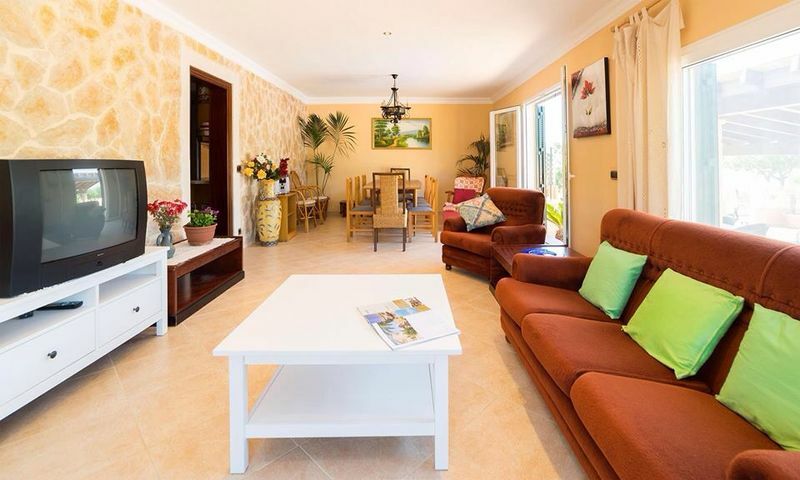 This modern and high-class holiday home with marvellous sea views is highly recommended for discerning guests expecting comfort, style, privacy and a cheerful ambience. 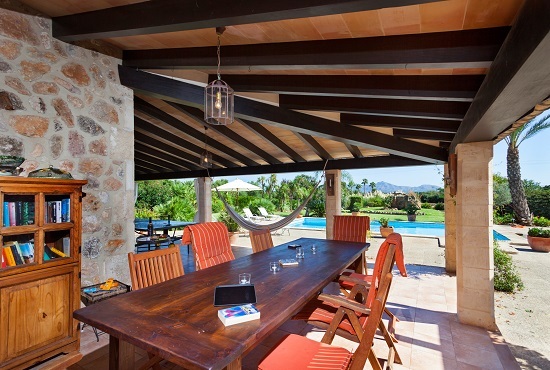 Nature lovers, golfers and beach enthusiasts will also appreciate the proximity to the beaches, golf clubs and into Tramuntana Mountains. 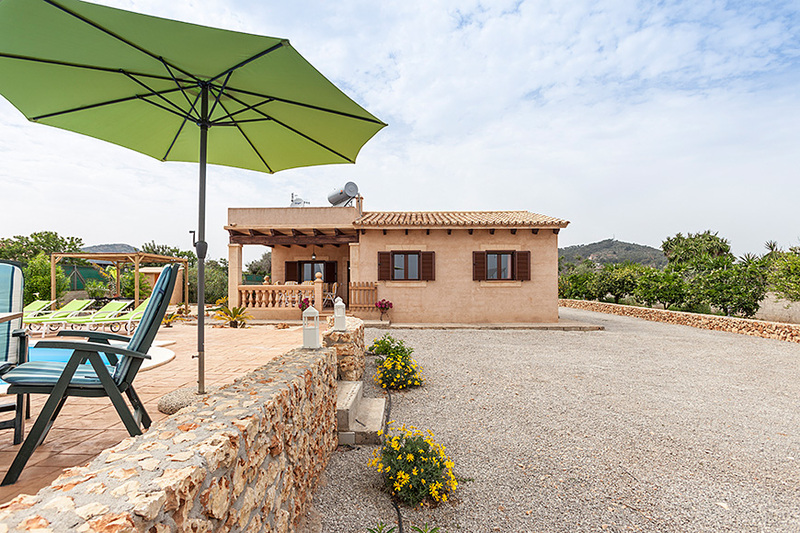 Central heating allows for all year occupation of this Finca. 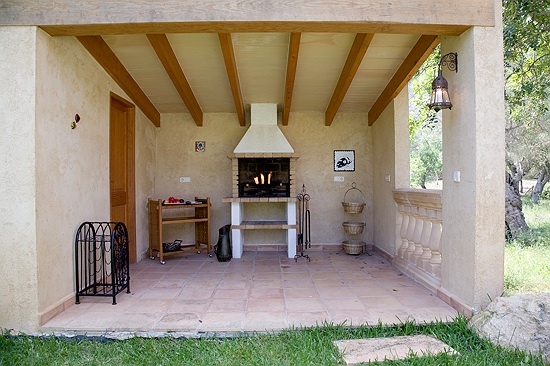 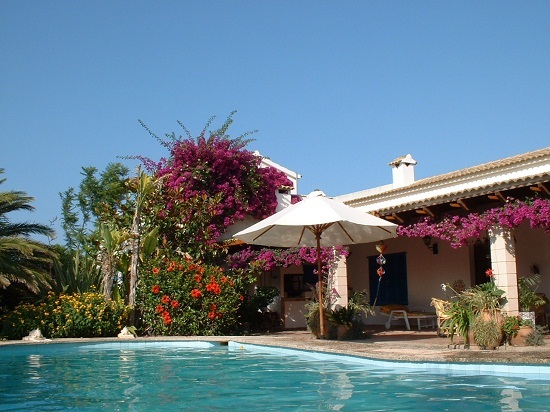 Finca Fiol is a modern, high-class holiday home surrounded by a most peaceful, serene countryside. 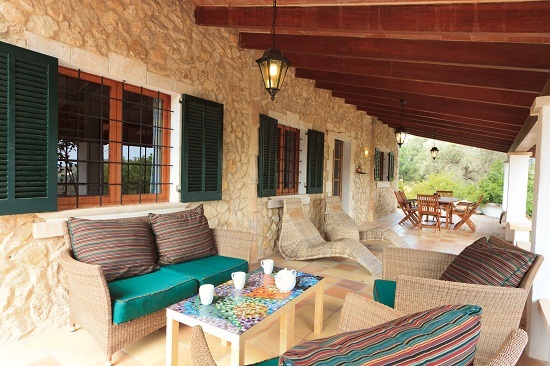 It is recommended for discerning guests expecting a high living standard within a stylish Mediterranean ambience. 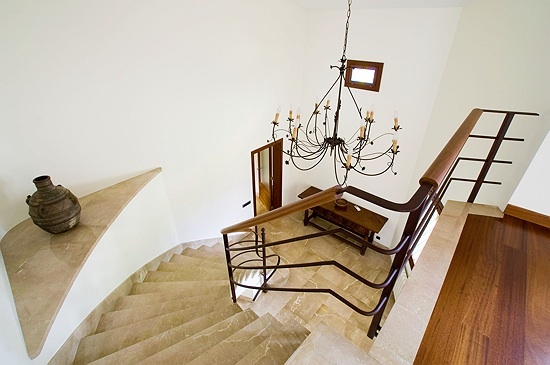 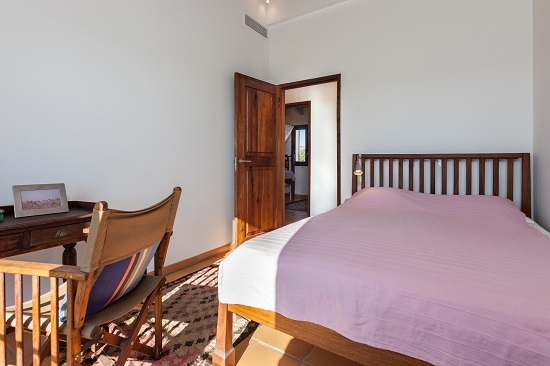 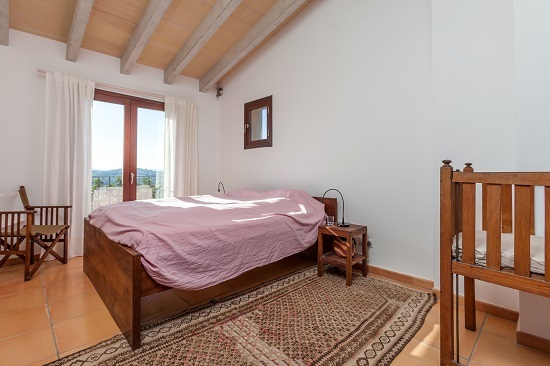 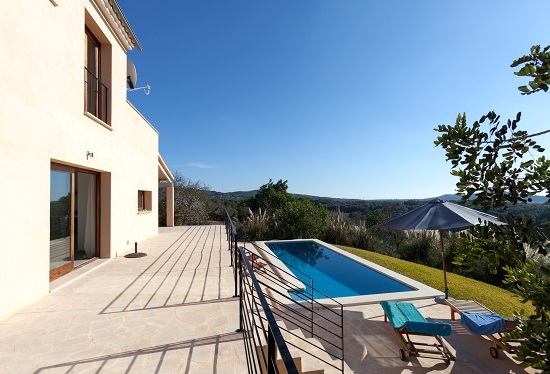 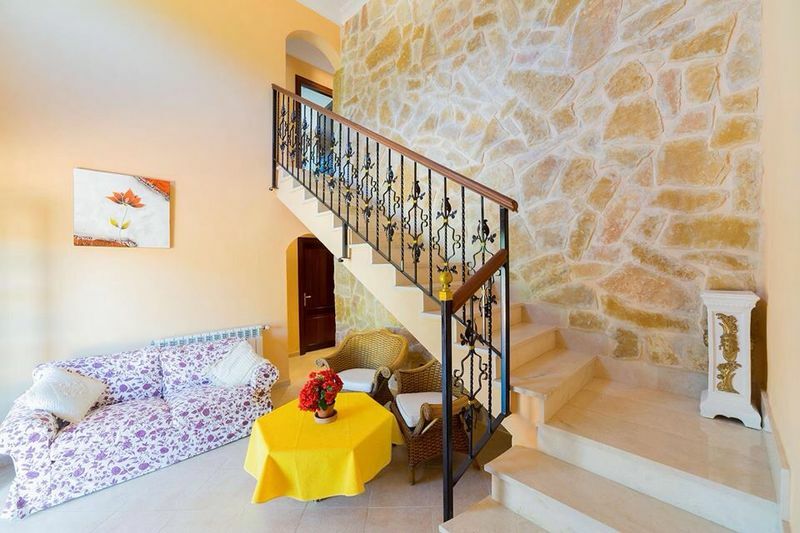 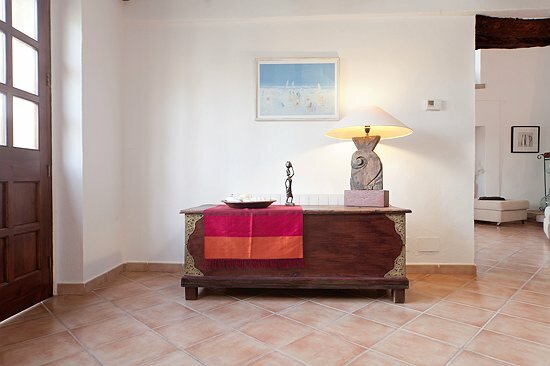 Located an a small hill halfway between Arta and Manacor, Villa Casa Sungura overlooks very serene countryside and the small town of Sant Llorenc des Cardassar. 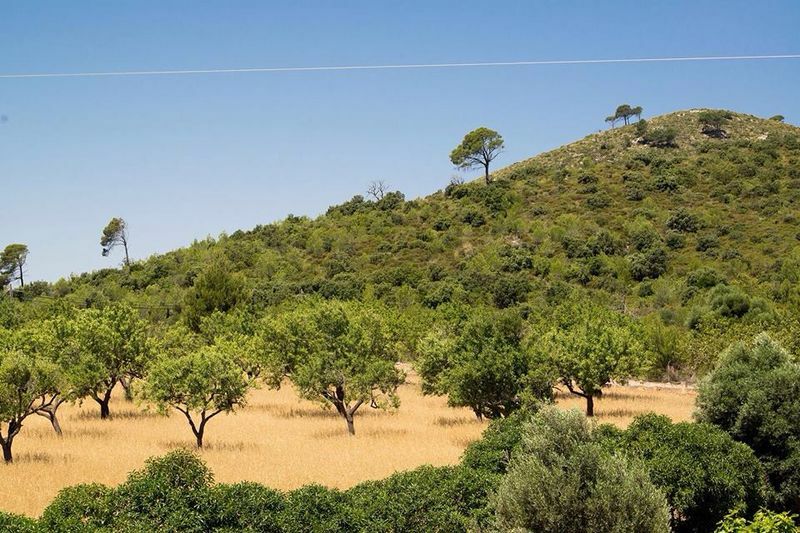 The property is generously sized, tranquil, with no neighbors closeby. 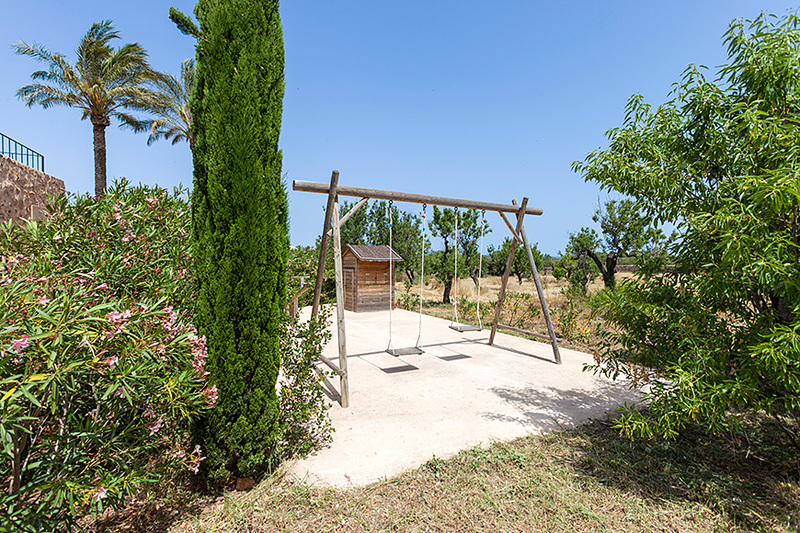 It is surrounded by almond trees, grazing sheep with softly ringing bells and rabbits playing on the fields – therefore the villa´s name Casa Sungura, which translates into House of the Rabbit. 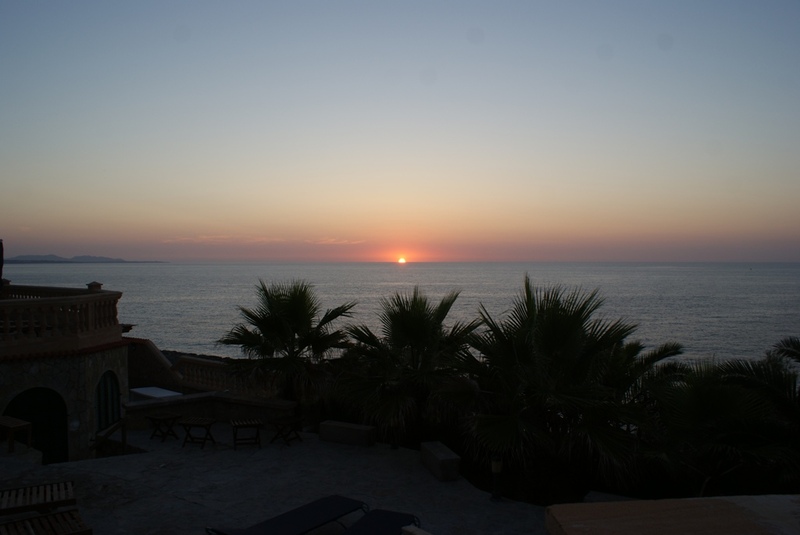 The coast of Costa los Pins is a 15 minute drive away. 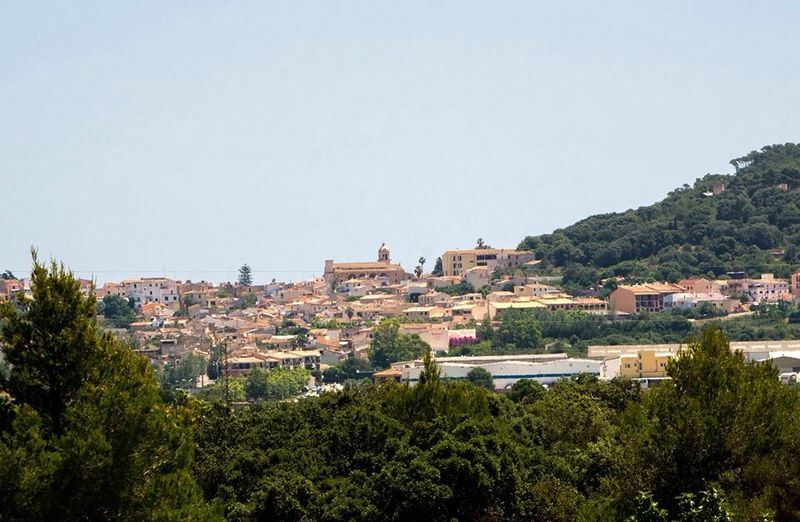 In both neighboring villages Son Servera and Sant Llorenc, you will find several good restaurants and basic shopping facilities. 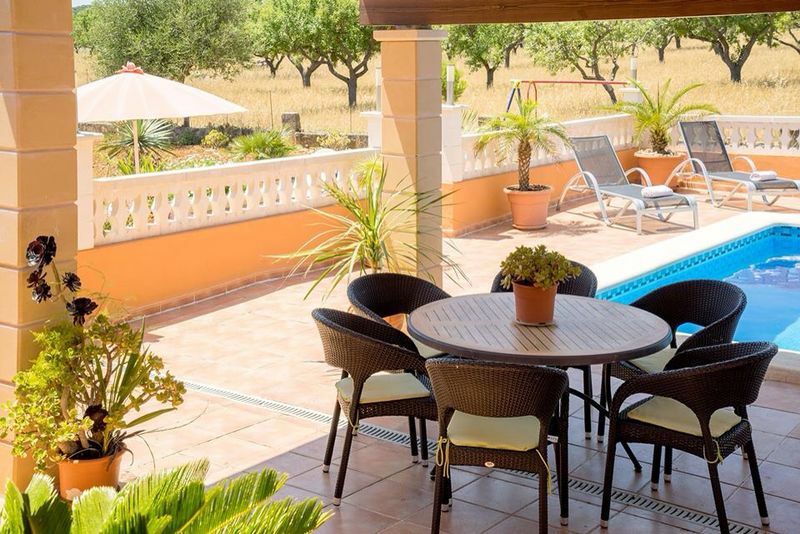 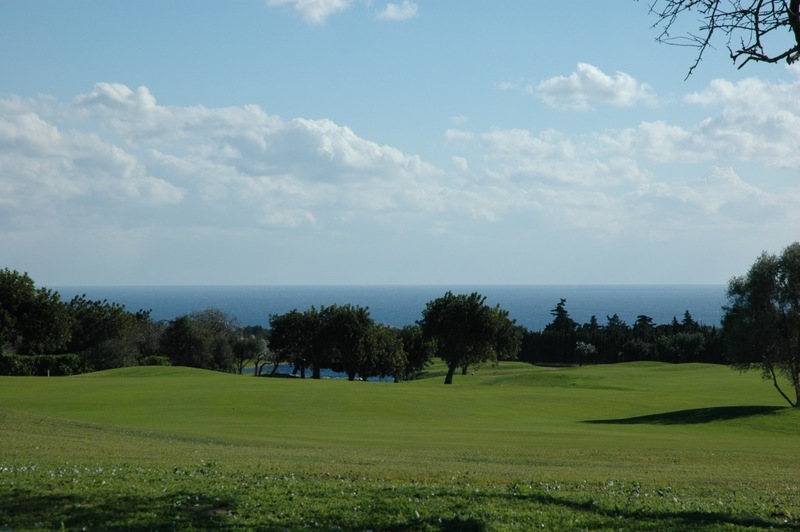 Tennis enthusiasts may play matches at courts in Sant Llorenc and Manacor, an golf lovers will appreciate the proximity to Golf Club Son Servera and more golf courses nearby. 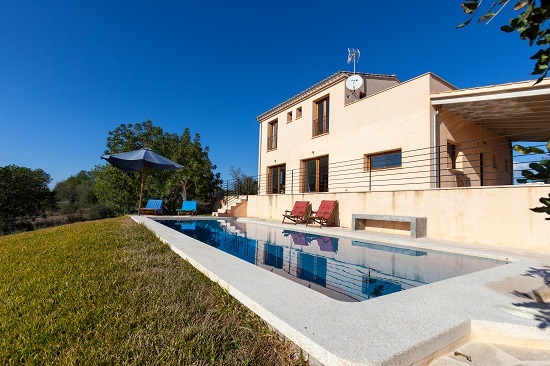 Total tranquillity, privacy and endless views from the garden and the two upper terraces into unspoilt rural nature combined with modern cheerful living comfort and all amenities for a relaxing holiday characterize this traditional Majorcan-style Finca. 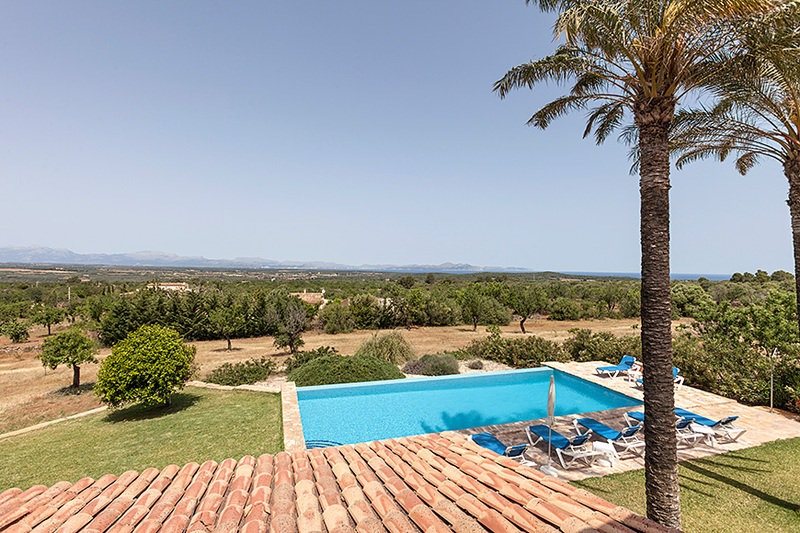 A choice of beaches and golf courses are only minutes away, and there is the option of horse riding at Son Serra de Marina. 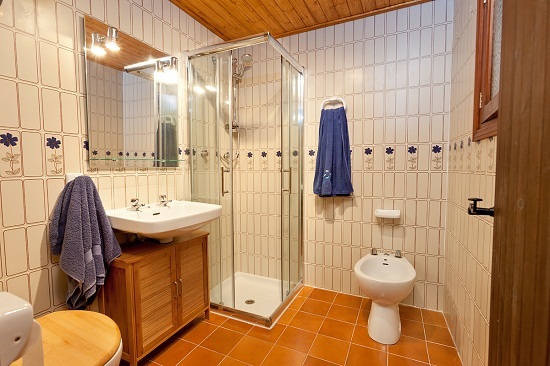 Central heating is available for the chillier winter months. 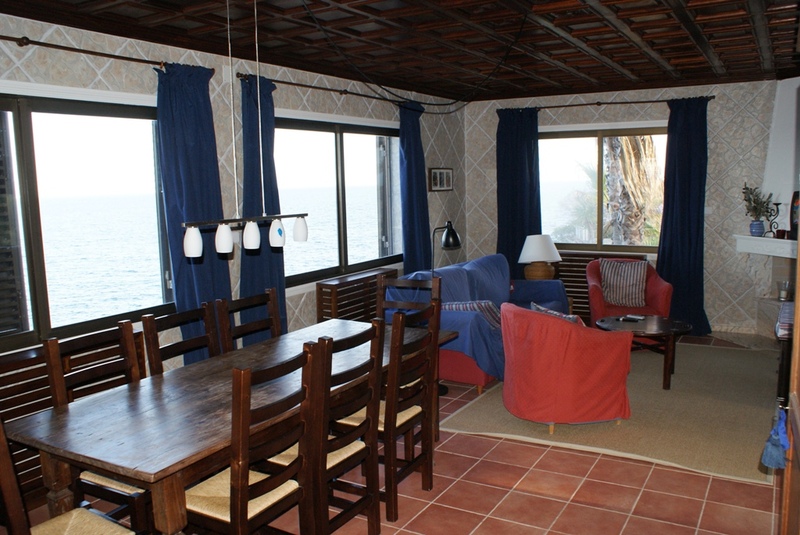 Internet/ W-Lan to be installed soon. 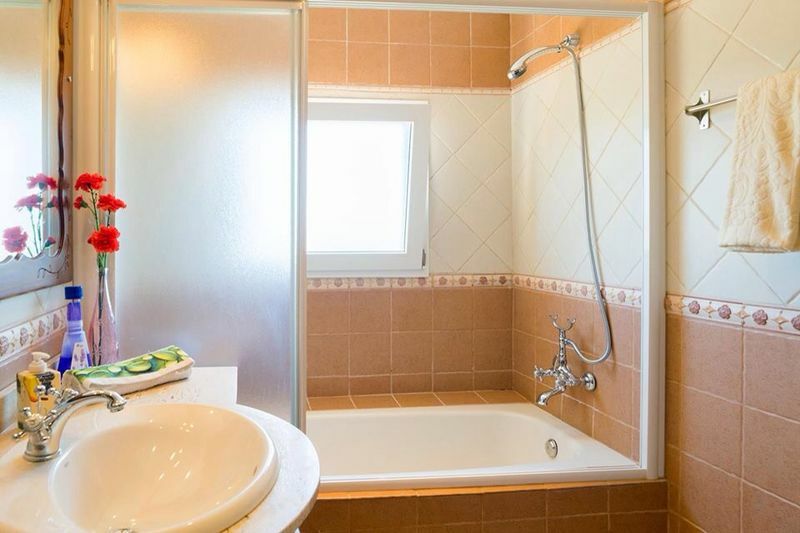 Internet: W-LAN available. 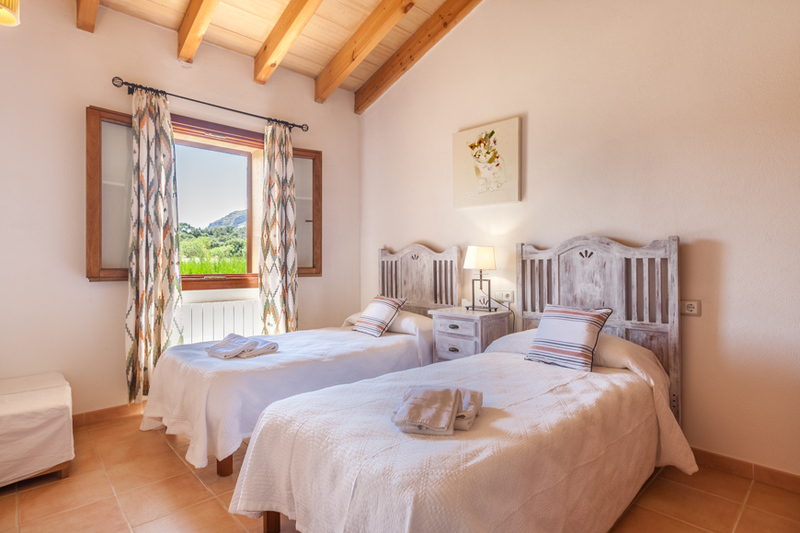 The panoramic views into the slopes of the Tramuntana mountain range and the Bay of Palma in the distance are truly stunning and the peaceful tranquility of the mountainous region is balm for any stressed soul. 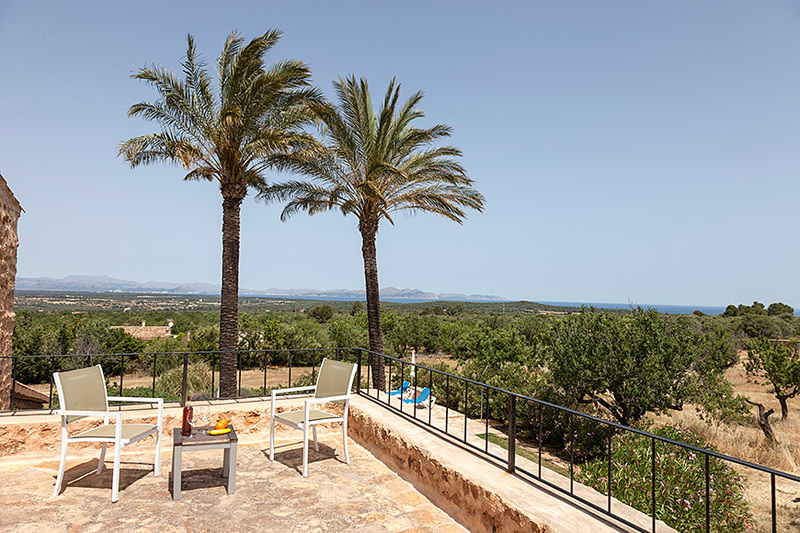 On a clear day you can see the distance the Bay of Palma. 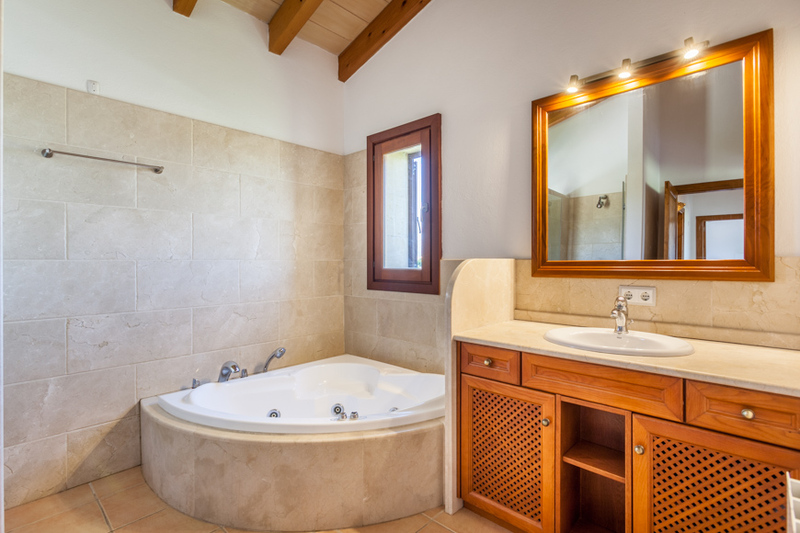 Enjoy the new jacuzzi at the pool terrace. 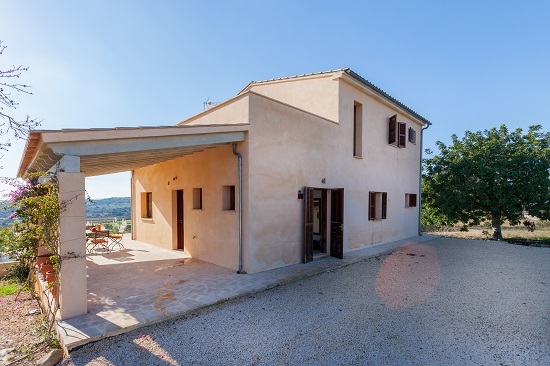 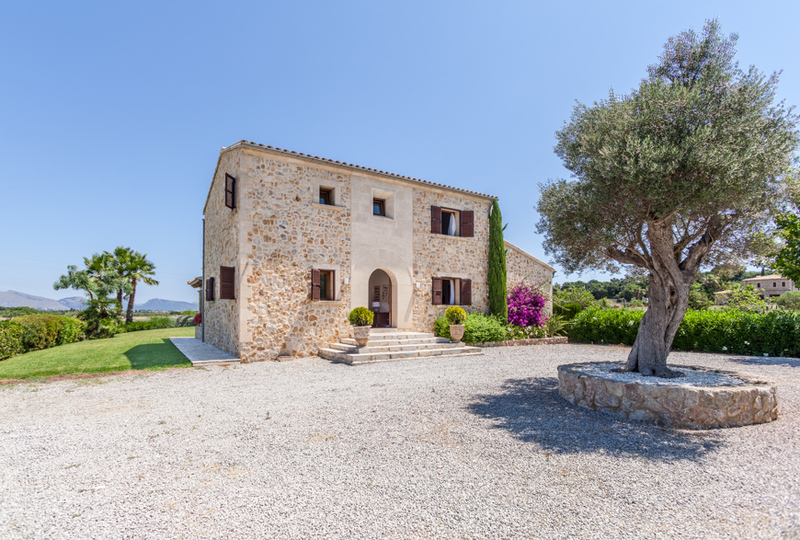 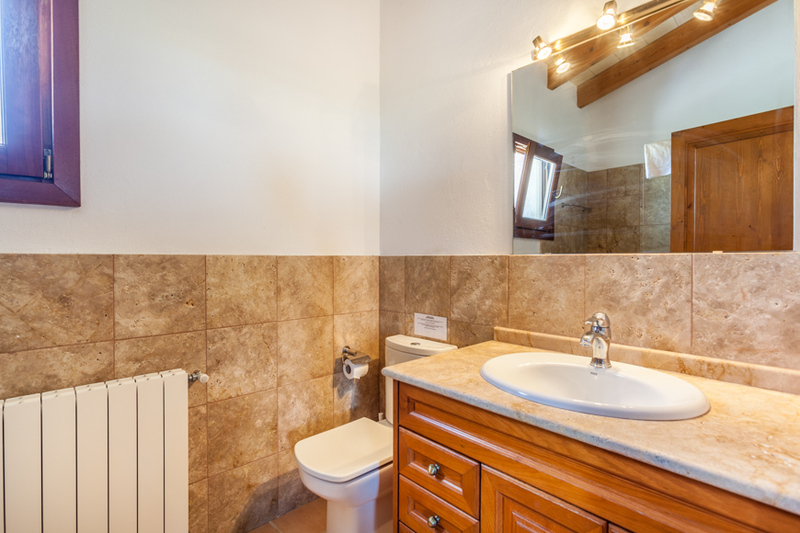 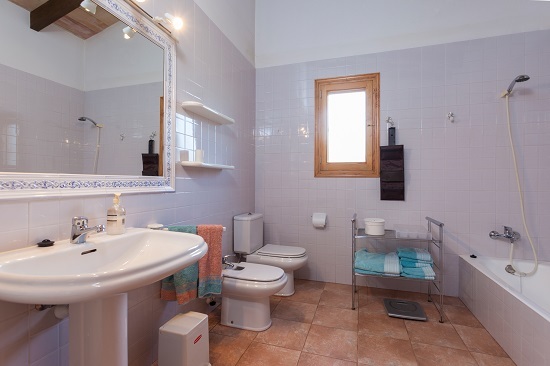 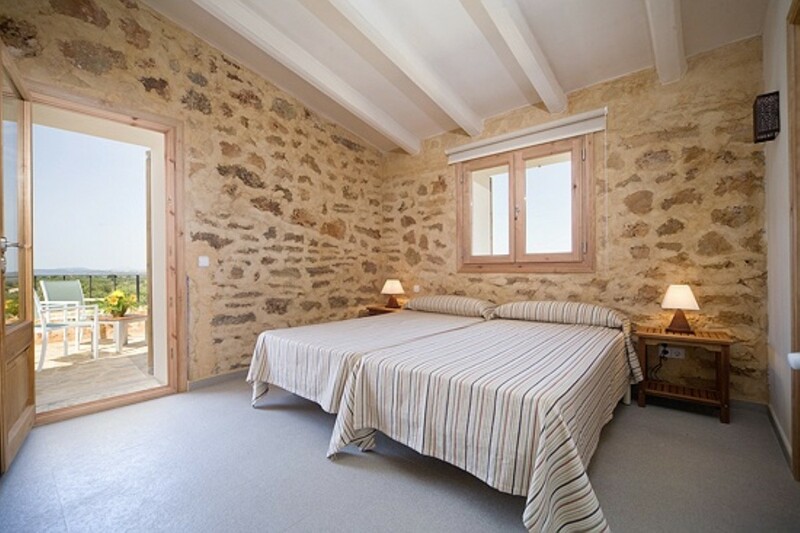 Can Soler is a very attractive, rustic-style country home with stunning views and located in the vicinity of the picturesque old town of Pollença. 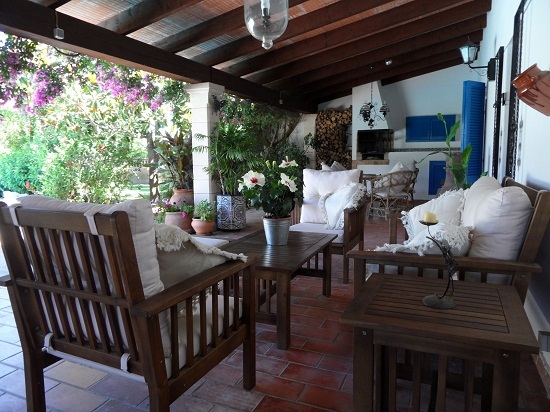 The sun covered terrace with its comfortable seating area and the brick-built barbecue, is ideal for meals al fresco or just for relaxation. 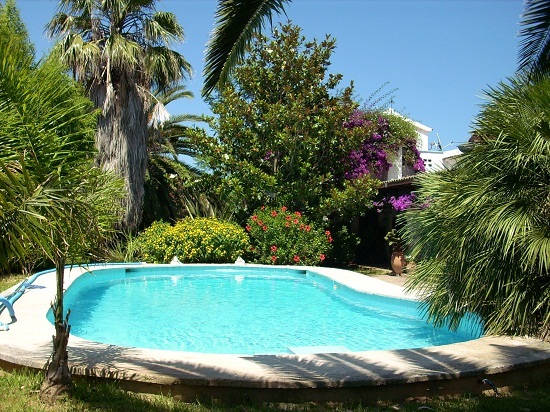 Adjacent is a large kidney-shaped pool with outdoor shower. 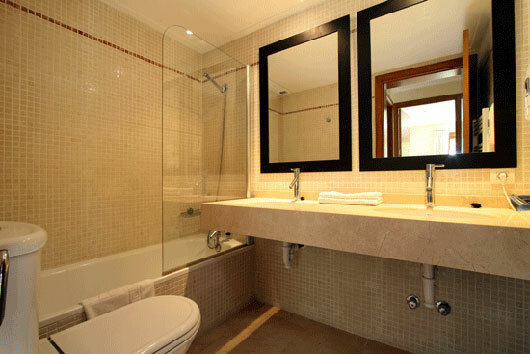 Tastefully furnished and designed for relaxation. 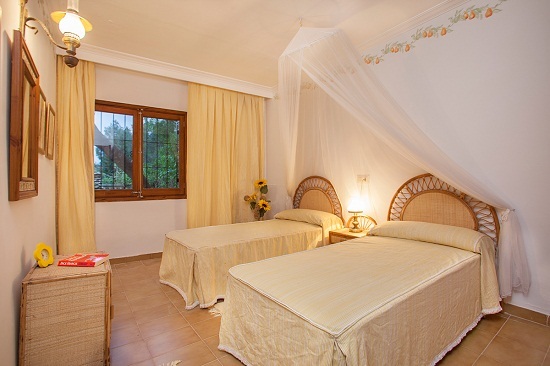 A holiday paradise for the whole family. 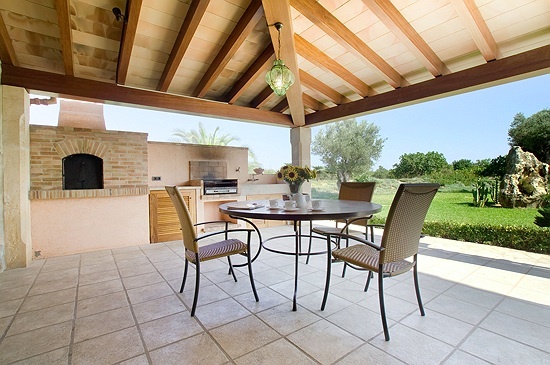 Great entertainment areas inside and outdoors. 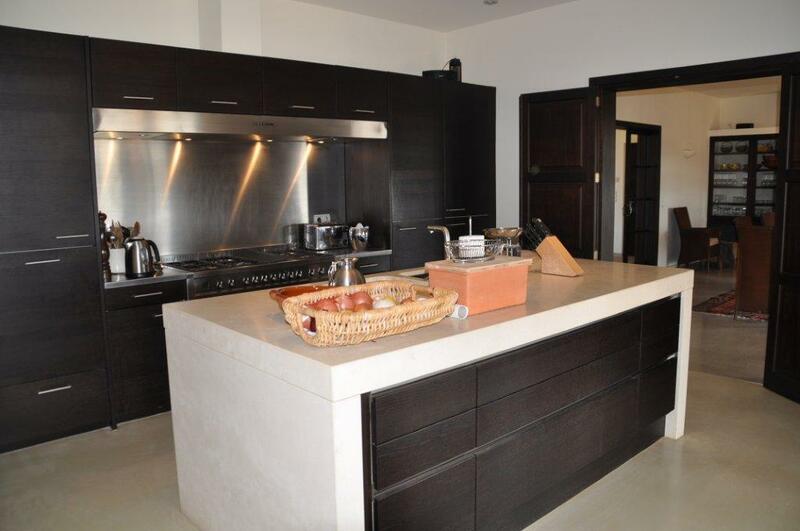 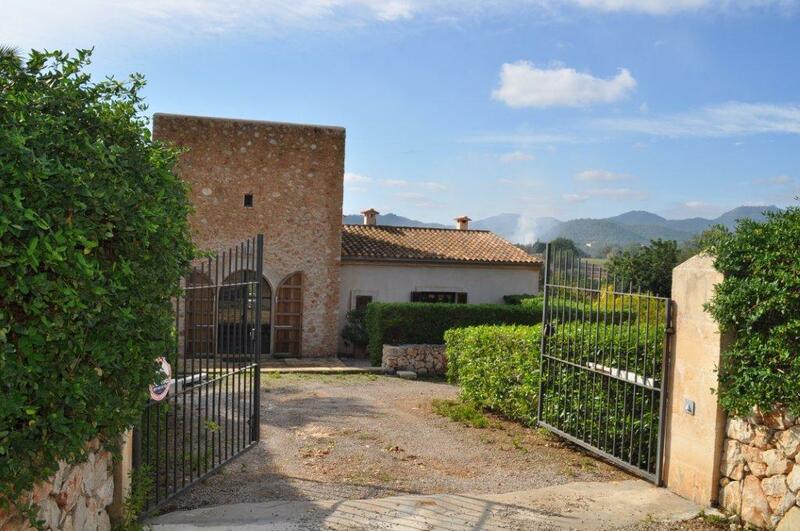 This newly built country home is located in the peaceful surrounds of the village Es Llombards. 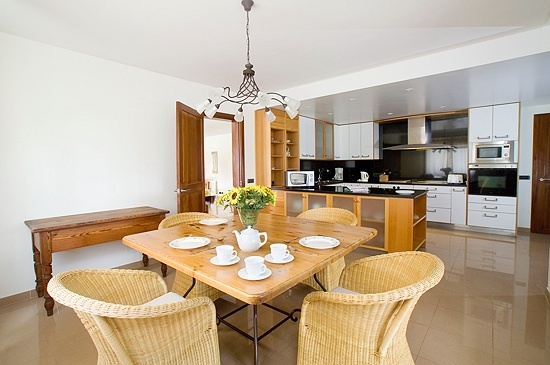 Several seaside resorts and beaches are are just a couple of car minutes away. 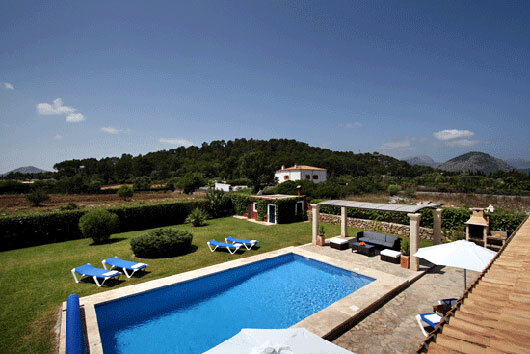 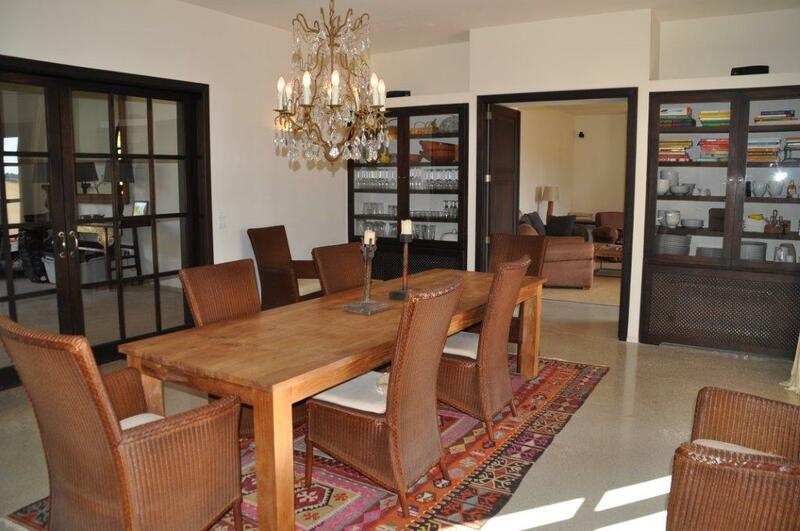 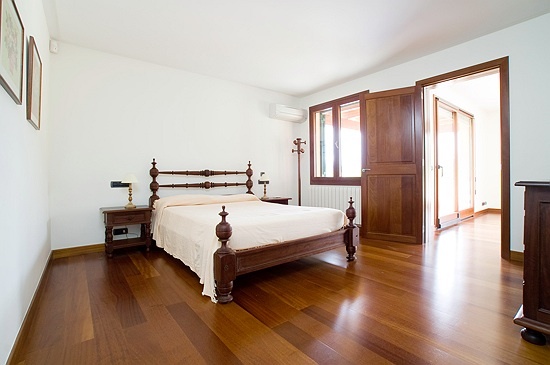 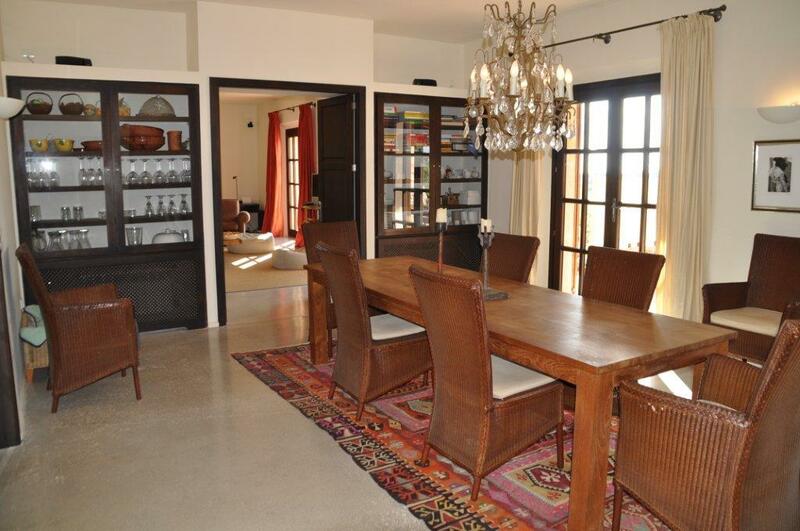 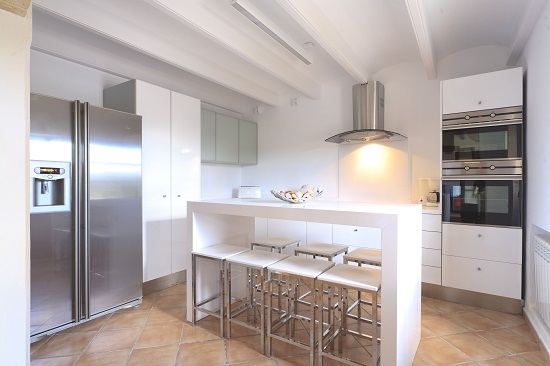 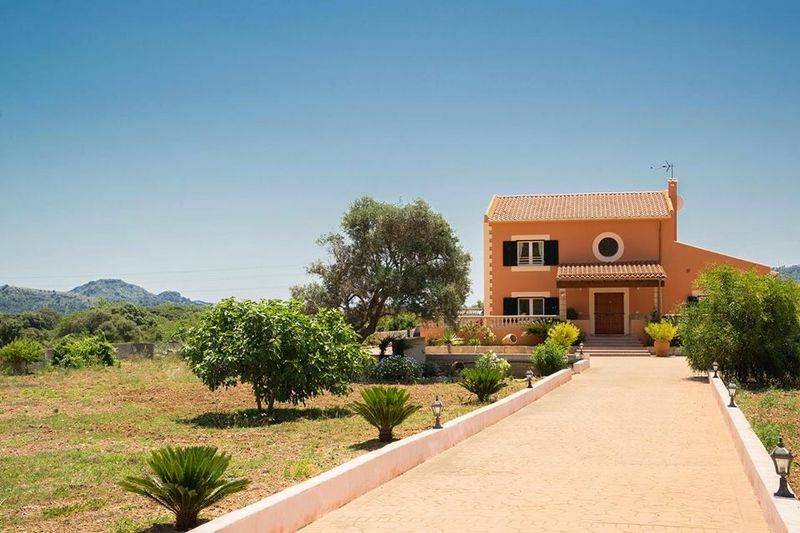 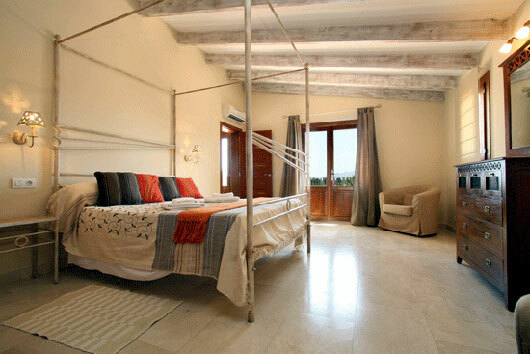 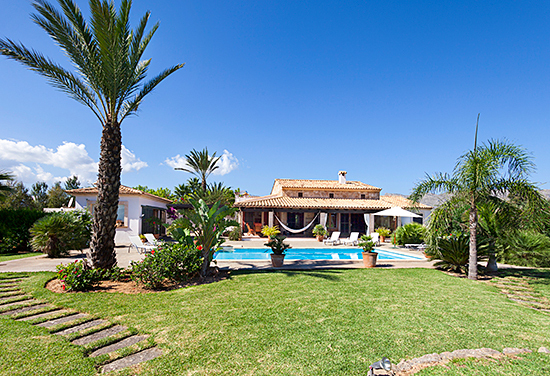 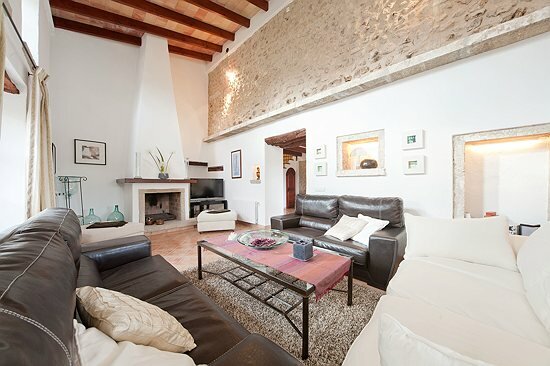 The Majorcan-style manor house rests peacefully in the attractive area of Porto Colom. 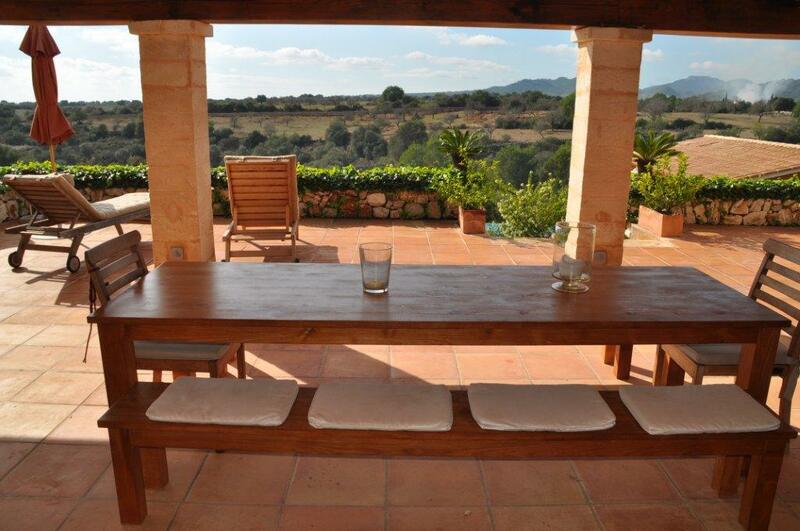 It is surrounded by 15.000 m² of intact nature and enjoys marvelous panoramic views. 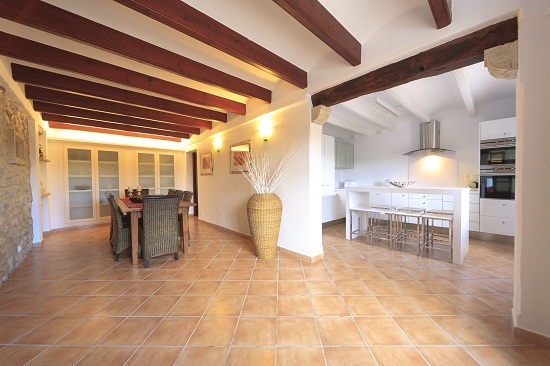 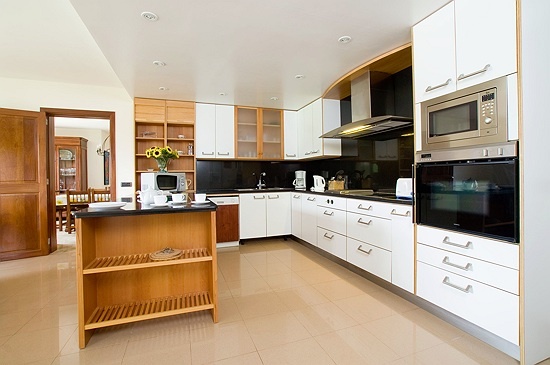 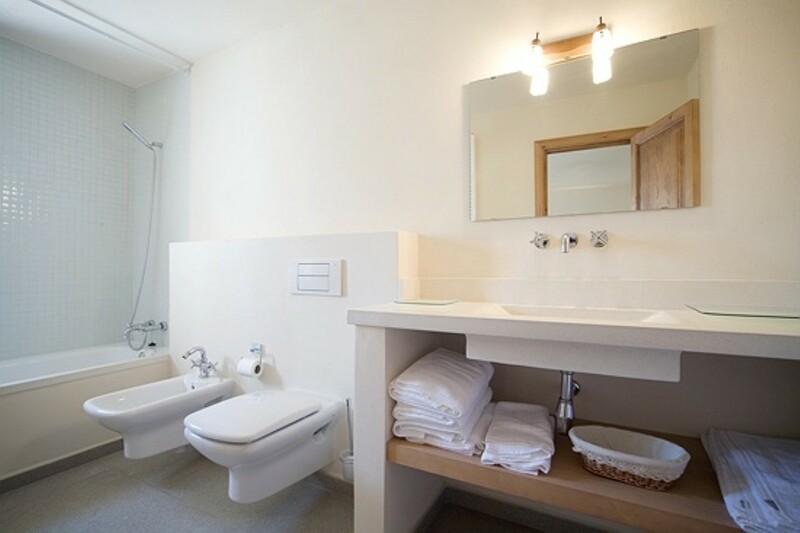 The high quality furnishing and equipment includes central under-floor heating for the chillier months of the year. 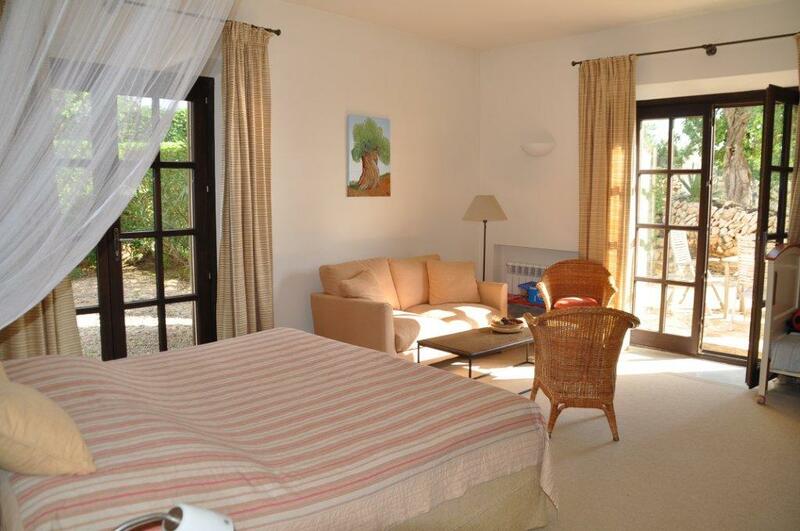 The golf club Val d´Or Golf with its beautiful clubhouse and excellent restaurant is nearby. 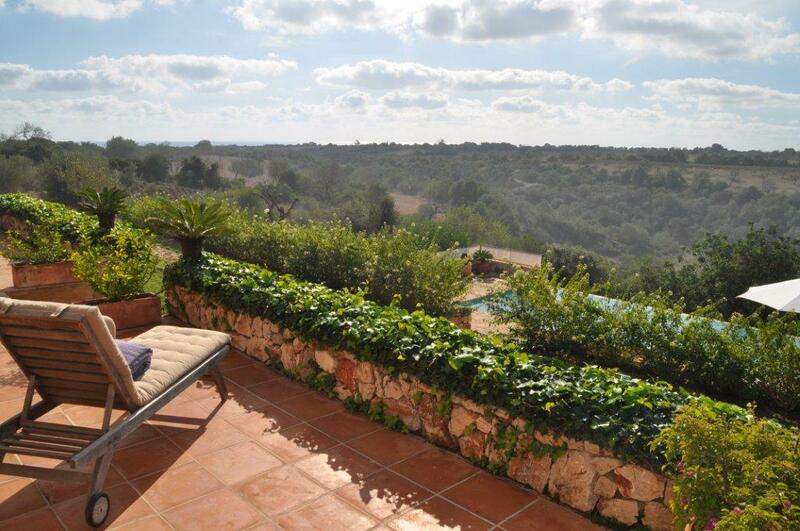 Villa Bonita vistas is located in the middle of a nature reserve. 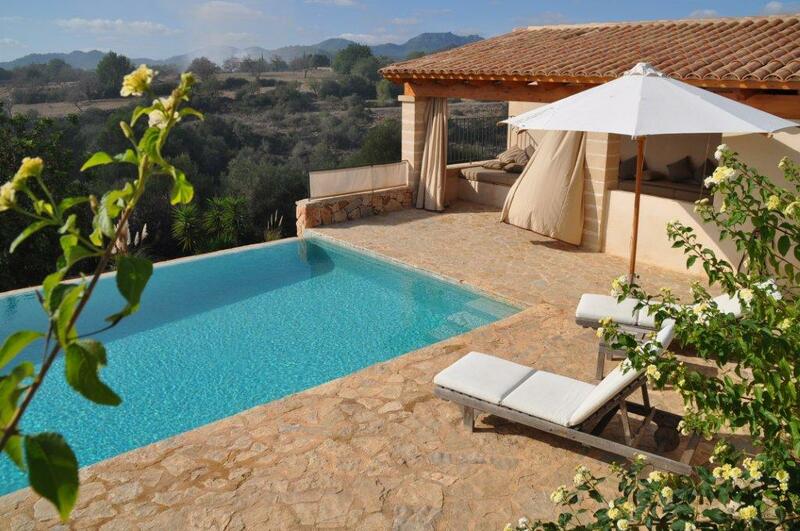 Enjoy incredible views from your terrace and unwind your soul in the sun beds next to the beautiful pool. 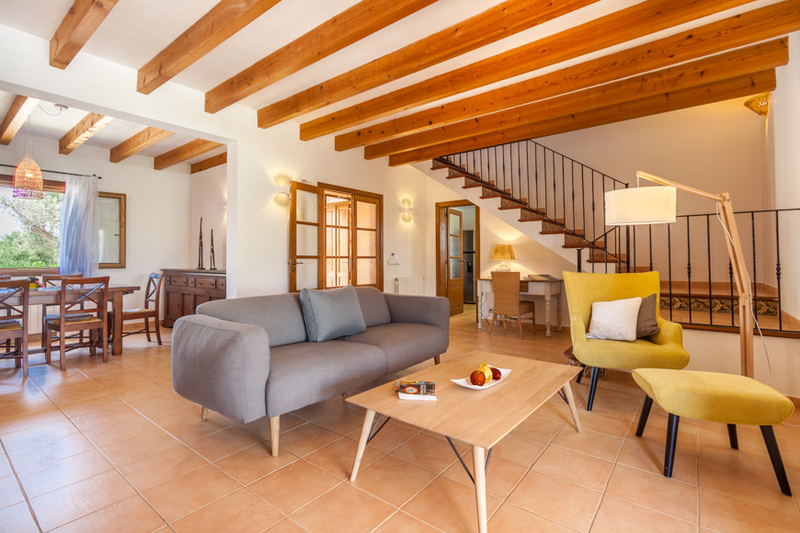 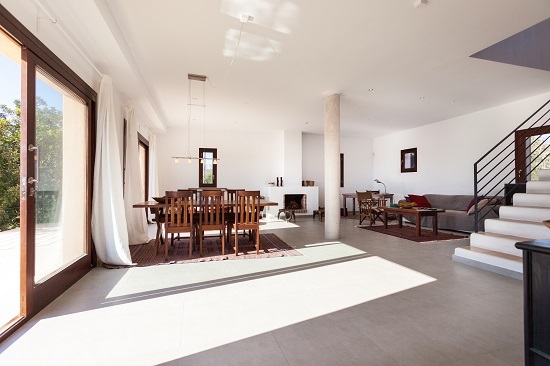 This charming Finca has been completely renovated and refurbished, successfully blending modern with antique elements to create a stylish and most comfortable holiday home. 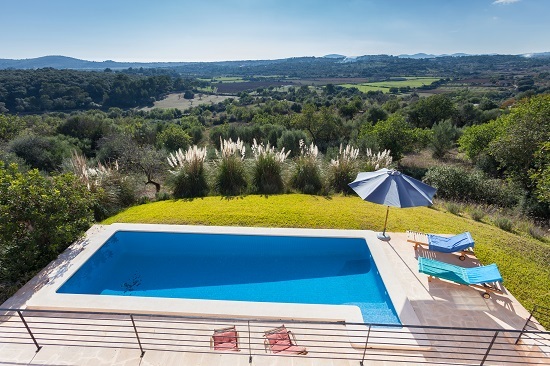 Plenty of space in and around the Finca and the large pool amidst generous garden greens ensure many pleasant hours of enjoyment and relaxation. 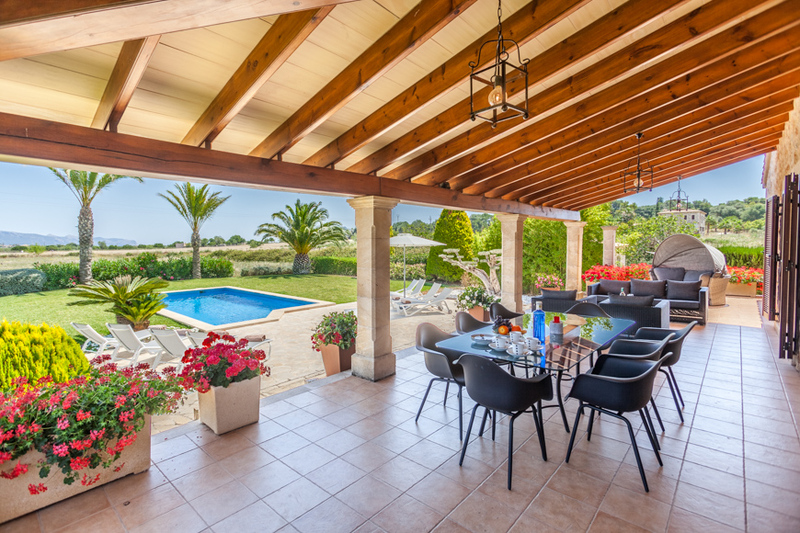 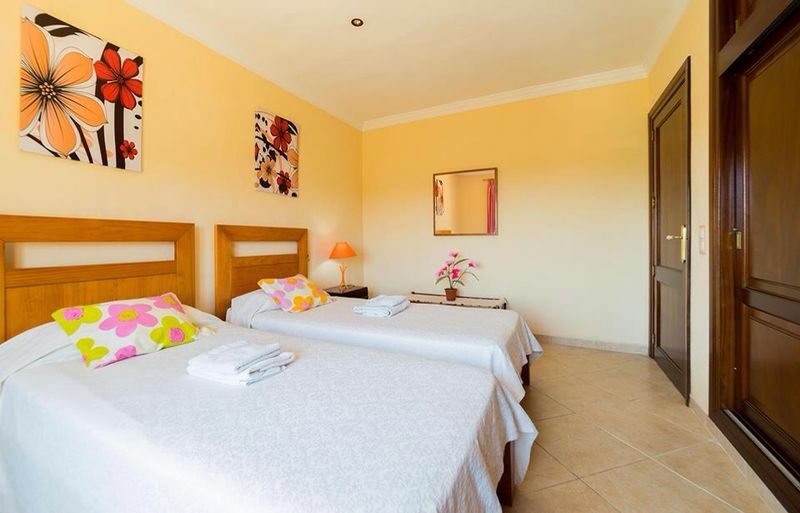 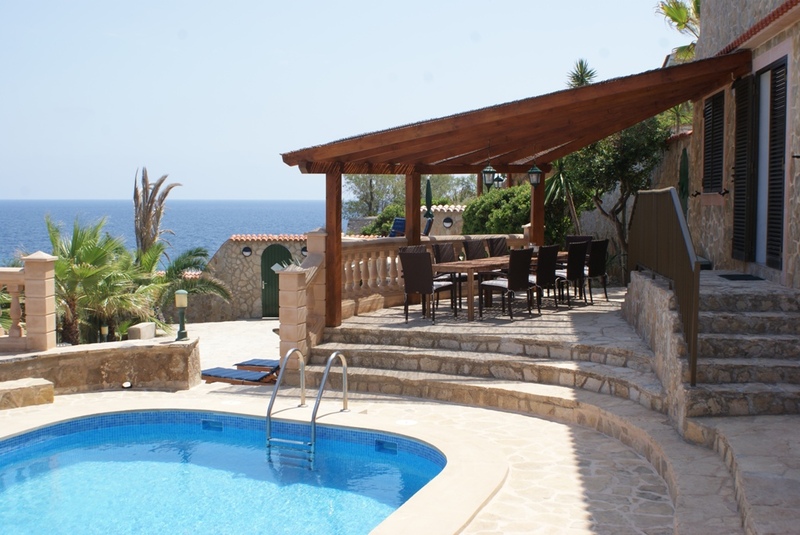 The Villa with its large pool and the Barbeque house offers plenty of privacy and is surrounded by numerous entertainment areas all inviting our guests to relax and to enjoy. 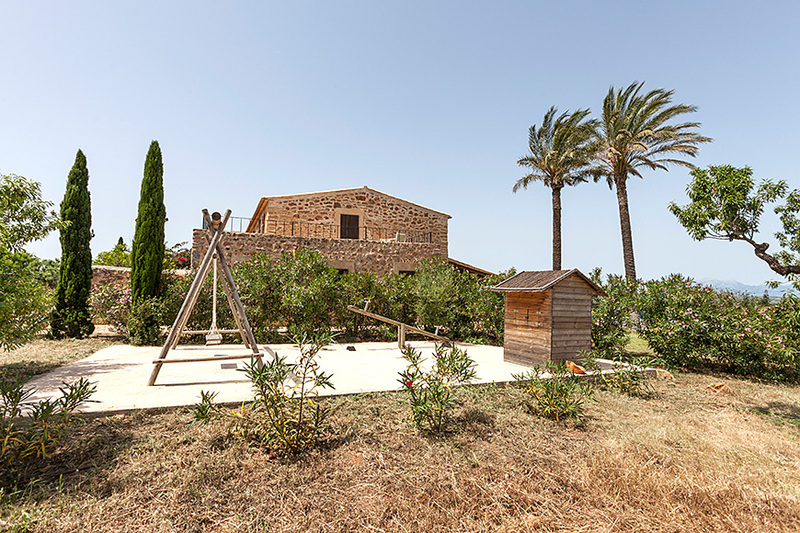 Guests may also use the four bicycles available to explore the beautiful neighborhood. 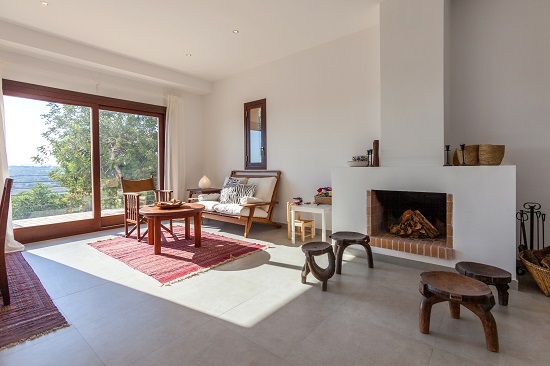 A representative holiday home with guest house, designed to spoil its guests with a blend of contemporary, high-class furniture and traditional décor elements, creating a distinctive Mediterranean ambience and privileged life style. 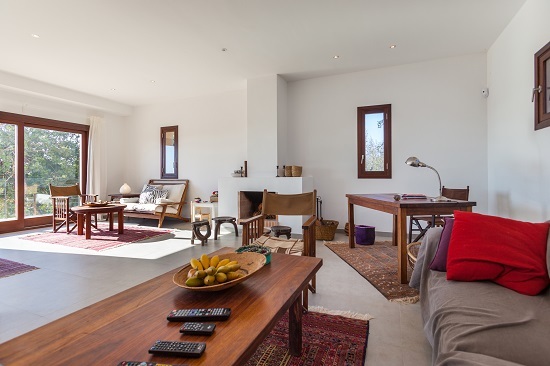 Each bedroom has its own TV, and a choice of sun-shaded and sun-exposed terraces including a pavilion in the pool garden provide for perfect relaxation. 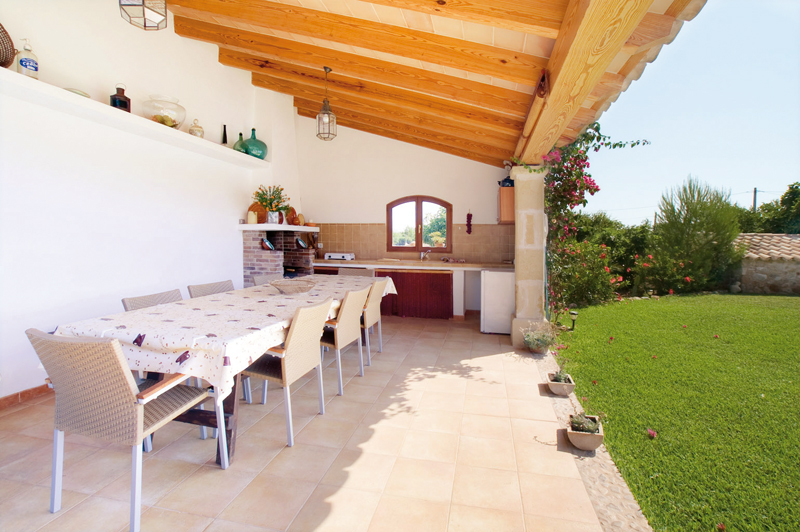 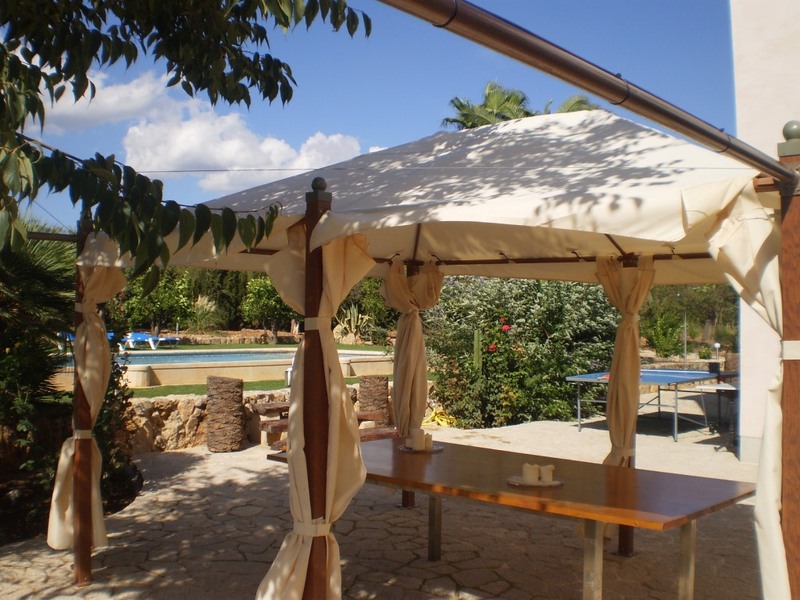 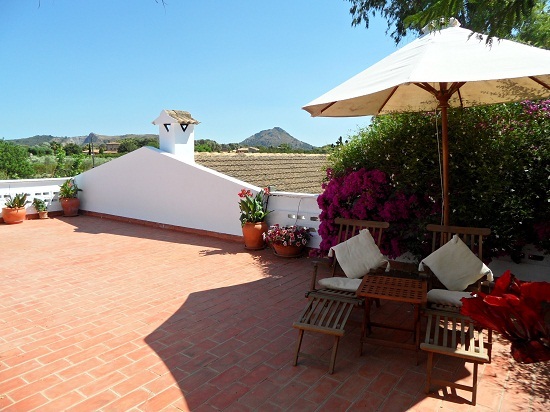 A refurbished, modern, family-friendly Finca with a lovely outdoor area. 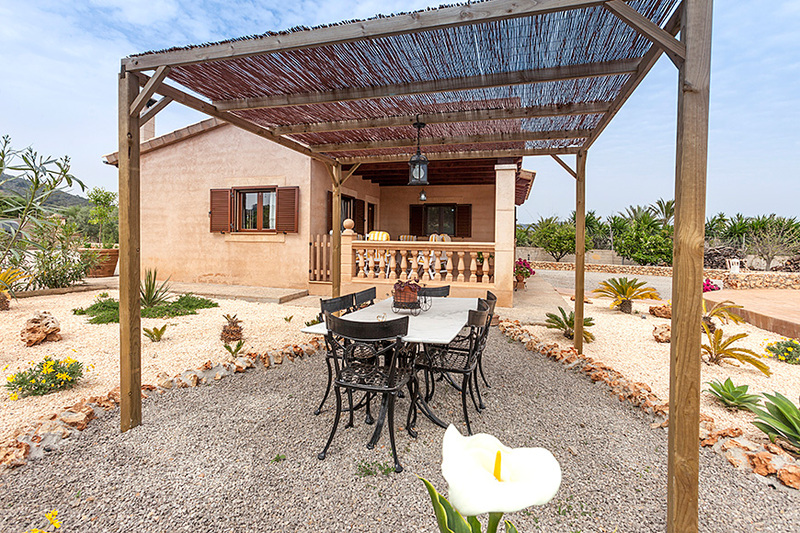 Finca Aumadrava is the perfect choice for a relaxing holiday in serene countryside with many different possibilities to discover interesting beaches and the beautiful nature during your stay. 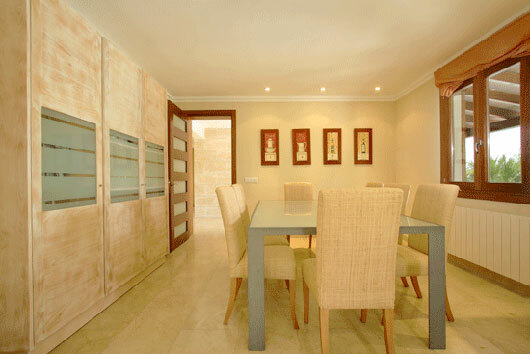 Please note: larger groups can spread-out into the neighboring Finca Elisa, if available.